When the Second Europan War sweeps across Europa, Claude Wallace and his friends Kai Shulen and Raz, join the Federation Army to defend their homeland against the Imperial forces. Despite his record at the military academy, Claude initially has trouble leading his troops, but after earning the respect of his subordinates and successfully completing the Ranger Corps training, Claude is assigned command of Squad E. During training, Kai disappears, and his younger sister, Leena, replaces him. Squad E participates in the Northern Cross offensive, designed to strike at the heart of the Empire. They are joined by Riley Miller, who is hostile towards Claude for having left her family to die during a fire. After liberating a castle and recapturing a town using ingenious means, Riley comes to trust Claude and his decisions. The Federation assign Squad E to capture the heavily defended Siegval Line, and despite the odds, Squad E manages to secure a foothold. They advance into an Imperial town and resupply, with Minerva’s squad deciding to hold a mock battle against Claude’s Squad E. Once the exercise has ended, a snowfall appears, signifying the early arrival of the bitter Eastern Europan winter that the Federation had not been anticipating. At this point, I am five chapters into Valkyria Chronicles 4, the proper successor to 2008’s Valkyria Chronicles. Released during March 2018 for PS4, and then other platforms in September 2018, Valkyria Chronicles 4 returns to the iconic Europa where the Federation squares off against the Empire in a war analogous to World War Two. 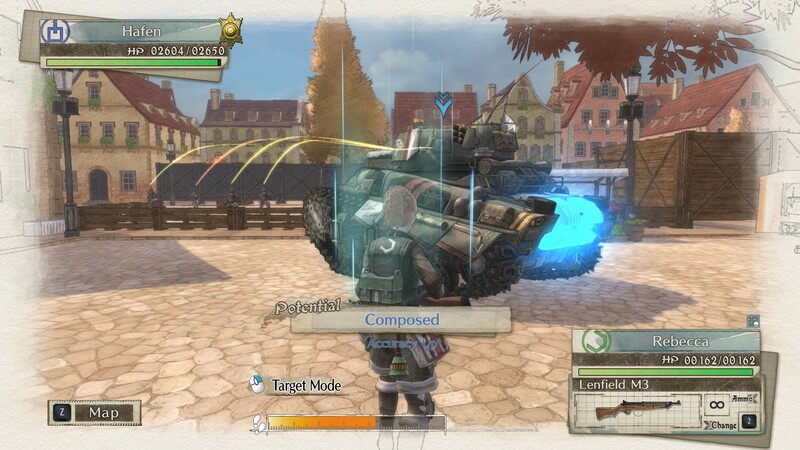 With nearly a decade since the original’s release, Valkyria Chronicles 4 is an incremental upgrade, bringing with it the grenadier class and an armoured personnel carrier that introduces new means to approach each mission. 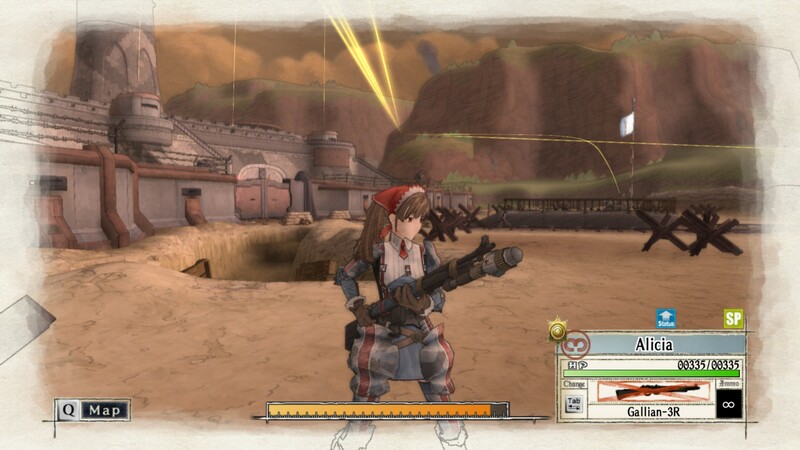 I come into Valkyria Chronicles 4 as a veteran of the original Valkyria Chronicles, and from a gameplay perspective, Valkyria Chronicles 4 is a direct upgrade over its predecessor; while featuring the same general mechanics as Valkyria Chronicles, Valkyria Chronicles 4‘s new classes and vehicle options, plus a handful of leadership mechanics, allow for missions to be solved in more clever ways than previously possible (stacking defense boost, demolitions boost and awaken potential on Alicia turned her into a beast that could solo entire missions in as few as two turns). However, as I’m still early in the game, I’ve yet to explore what all of the new features can do, and instead, my eye turns towards Squad E and its colourful cast of characters. 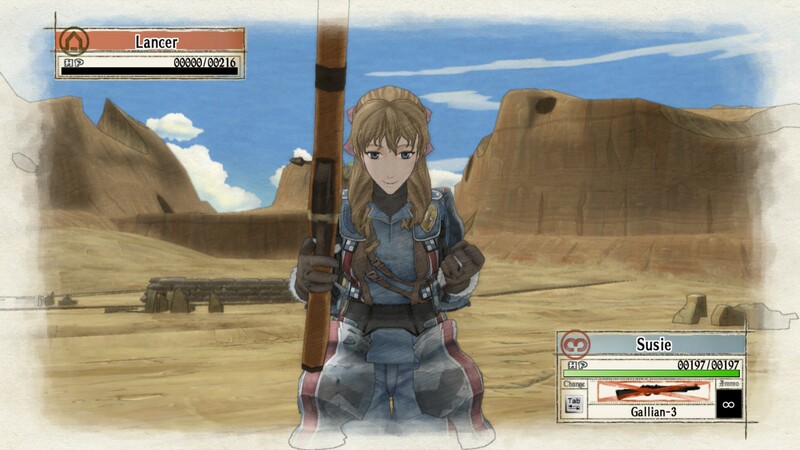 I admit that I miss Welkin, Alicia, Isara, Rosie and Largo: Valkyria Chronicles 4 follows Claude, Riley, Raz and Kai, who are similarly Gallians fighting for their homeland. 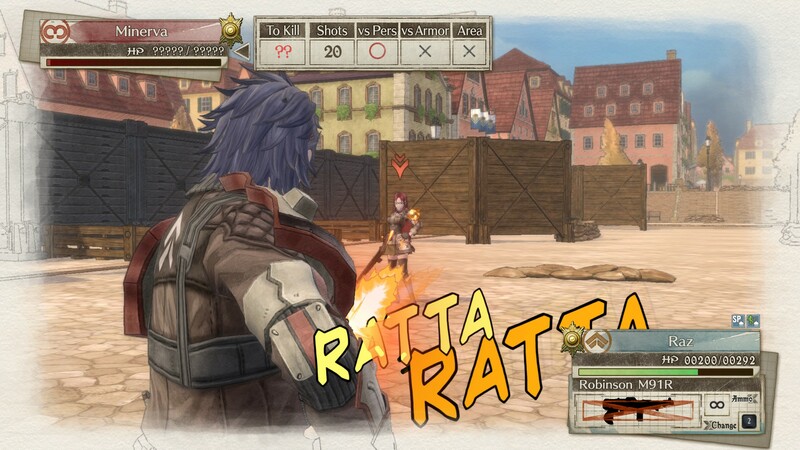 There are numerous similarities amongst the cast: both Claude and Welkin are attuned to their environment and utilise strategy against a superior foe. Both begin their journey by earning their squads’ respect, and over time, begin fighting more cohesively as a unit to have a tangible outcome in their war against the Empire. Seeing Squad E learn about one another better, as well as each of the characters’ backstories that adds depth to their reasons for being in the war. Within the space of five chapters, I’ve come to understand each of the major characters a little better, seeing how they handle in combat and during times of rest; with the Europan equivalent of a Real Soviet Winter™ coming, I look forwards to pushing Squad E further into Imperial territory, where I will doubtlessly square off against increasingly difficult foes, and where my über micro will be put to the test. 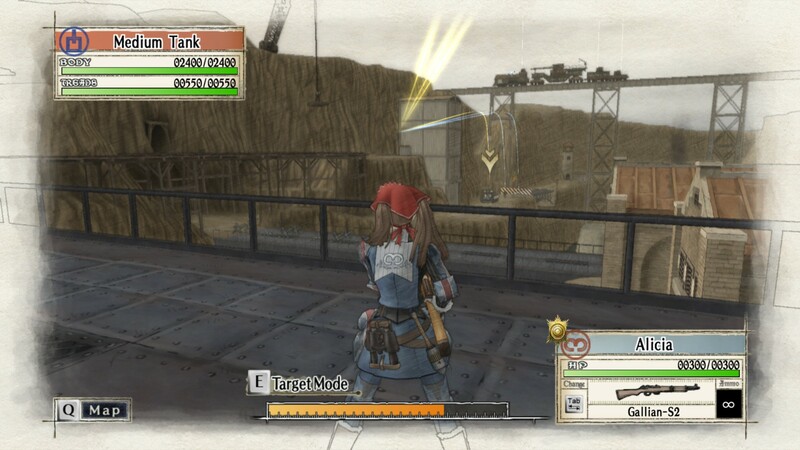 My immediate impressions of Valkyria Chronicles 4 is that textures have seen an improvement in detail, and the amount of objects in the game environment have been increased over Valkyria Chronicles. Lighting has also been improved, and there are real-time shadows now. The game is also rendered at native 1080p, so everything looks sharper: close inspection of the screenshots find that everything looks much more crisp, befitting of a 2018 title. 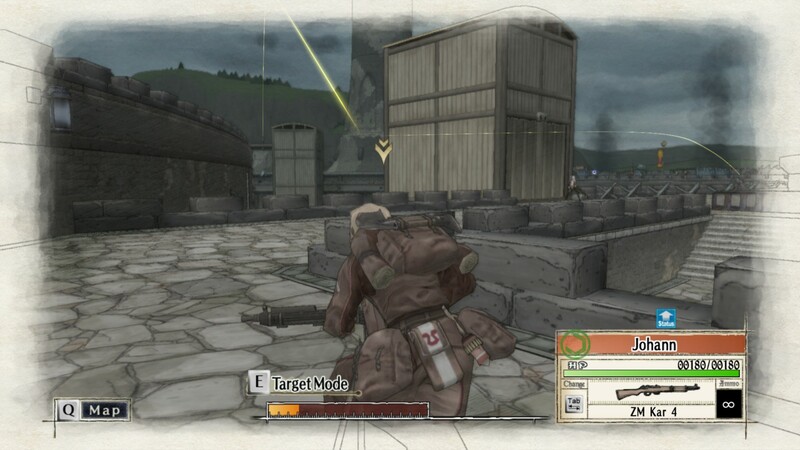 These updates are immediately apparent in the first mission, which acts as a tutorial to familiarise players with the controls, and it marks a welcome return into Valkyria Chronicles for me: I beat the original just before I defended my Master’s thesis. 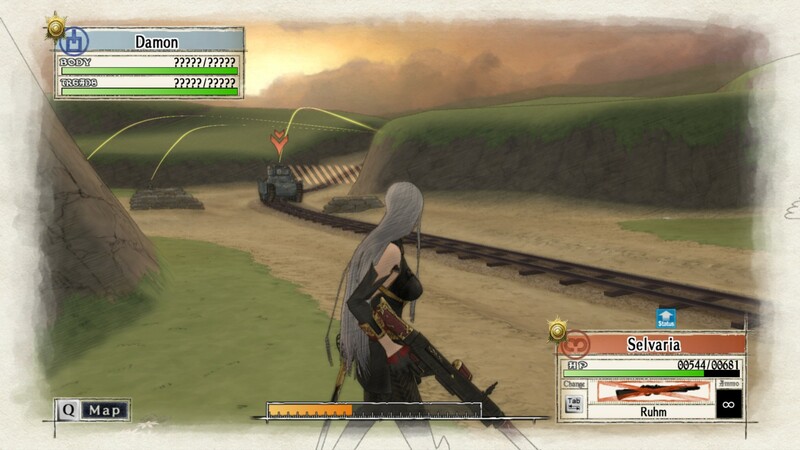 Here, I operate the Hafen, Valkyria Chronicles 4‘s equivalent to the Edelweiss. 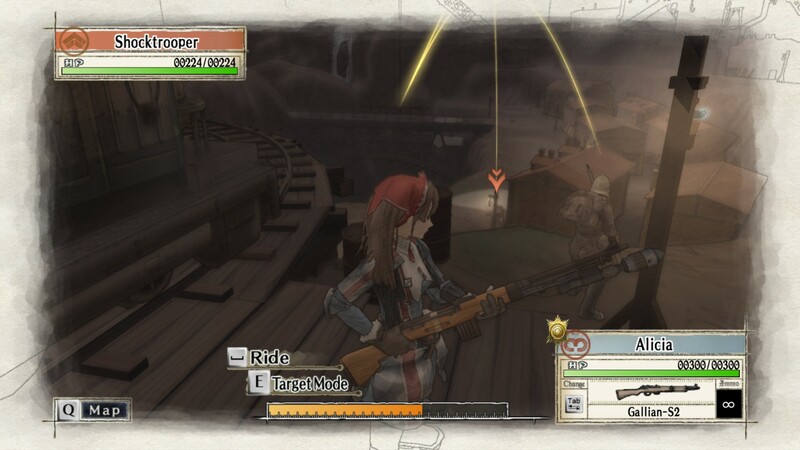 Unlike Valkyria Chronicles, using the Hafen only requires one CP now, as opposed to the two it took to operate the Edelweiss. 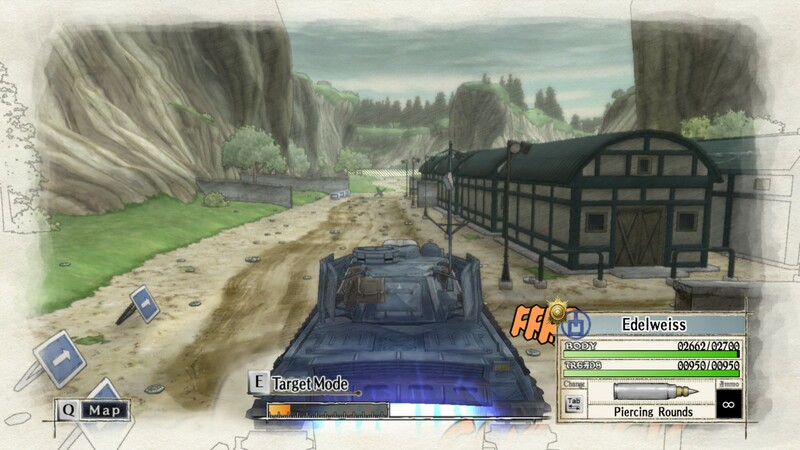 The Hafen is a medium tank at the start of Valkyria Chronicles 4, resembling the M4, and was heavily customised by Miles, the mechanic and driver who serves a similar role to Isara. Pushing into the second mission to capture a castle held by Imperial forces, I made use of the game’s classes to continue. 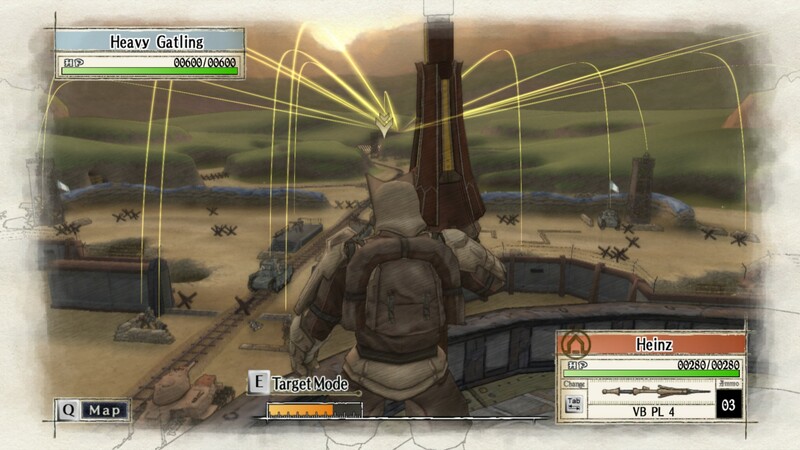 This mission requires that players cross a bridge covered by Imperial Gatling guns that can tear infantry apart. I opened by clearing a path for the scouts: Raz is the shocktrooper who fulfils a similar role to Rosie. He wield the Robinson M91, which looks a ways more advnaced than the Mags seen in Valkyria Chronicles and is probably inspired by the Thompson M1921 with a standard box magazine. 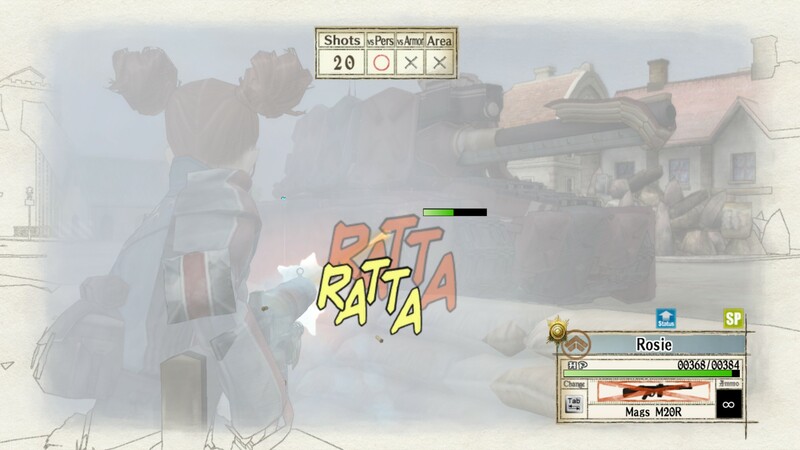 At the beginning of Valkyria Chronicles 4, there is no equivalent of Alicia, and scouts appear to have been balanced somewhat by varying the mission objectives. With this in mind, scouts remain highly useful for capturing objectives in missions where the goal is simply to occupy an enemy camp. 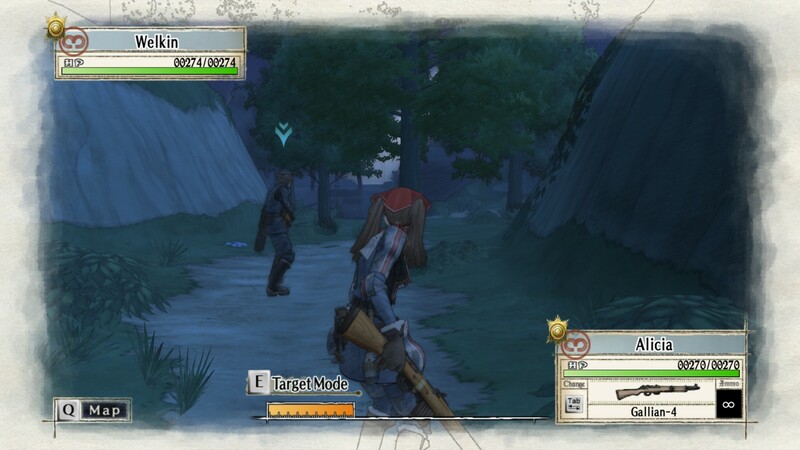 The scouts of Valkyria Chronicles 4 begin their journey with the Lenfield, an obvious callback to the Lee-Enfield rifle, and I found them moderately effective even against enemy shocktroopers right from the start. 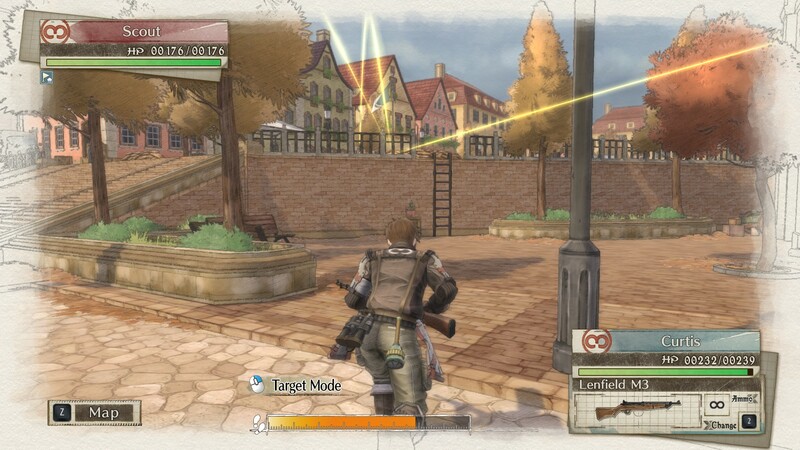 The grenadier class is a new addition to Valkyria Chronicles: they offer an indirect fire option for bombarding enemies from behind cover, and are limited by their movement, setup time and ammunition capacity. Ideally, they are placed somewhere safe and near an engineer, allowing them to hammer foes at moderate range. Riley is the first grenadier to be introduced, and while sporting a friendly personality, she becomes distant and hostile after seeing Claude for the first time. When Imperial forces begin rolling tanks into a village, Squad E is sent to investigate and identify the positioning of enemy tanks. There are a large number of decoys among the real tanks. Once all of the tanks are found, Squad E will attempt to call in an artillery strike, but communications jamming prevents them from doing so. Claude decides to use the clocktowers instead to indicate to allied forces where the tanks are, allowing them to destroy the Imperial armour. 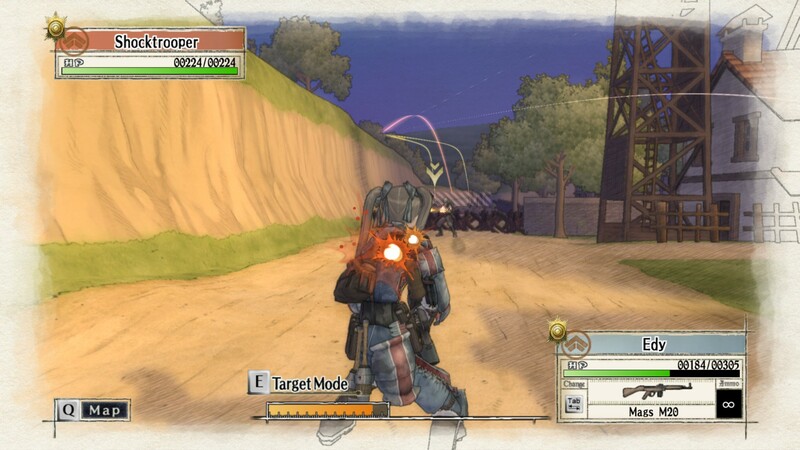 The outcome of this mission is similar to Valkyria Chronicles‘ Operation Cloudburst, where Welkin manages to take a mission-critical bridge in Vasal and in the process, earns the trust of Squad 7. By using the Clocktowers, Claude sets them all to read ‘715’, a number of significance to Riley. Proving that he is both capable, and that he’s not forgotten about the past, Riley reluctantly begins to trust Claude more. The remainder of Squad E have a stronger faith in Claude, and the story for this is explained in an interlude chapter. It turns out that during their time in training, Claude and Raz did not get along, with Raz viewing Claude as a coward. However, determined to unify his squad into a cohesive one, Claude declares that everyone under his command will pass Ranger training. During an exercise designed to stack the deck against Claude, he issues an order to Raz that proves instrumental in convincing the lone wolf that teamwork is essential, but also that he’s an essential part of the team – this allows Raz to reluctantly admit that they can work together, and since then, Squad E has proven to be a solid unit. 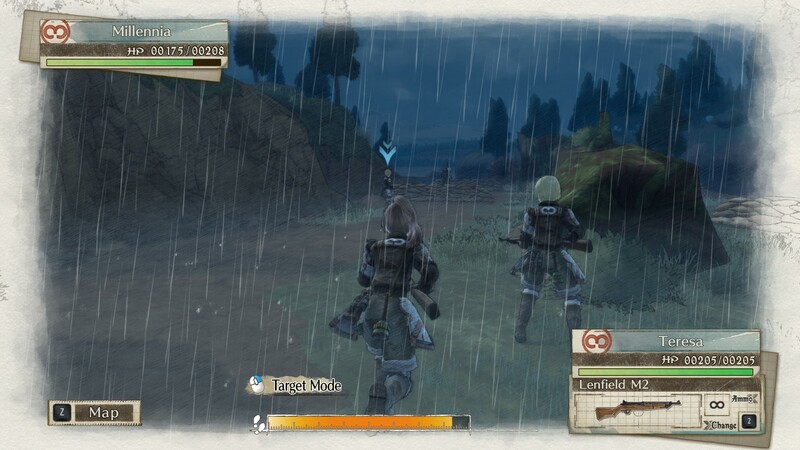 After a reconnaissance mission goes awry, Claude and Raz are separated from the others during a rainfall. This mission is unique from the others in that one must eliminate all enemy combatants – there are no camps to capture and no special units to neutralise. A combination of scouts, engineers and shocktroopers, plus the understanding that enemies will spawn behind the player’s starting position, is essential to completing this mission in a swift and efficient manner. Only after eliminating the forces behind the starting point, should one begin advancing towards the centre of the map. 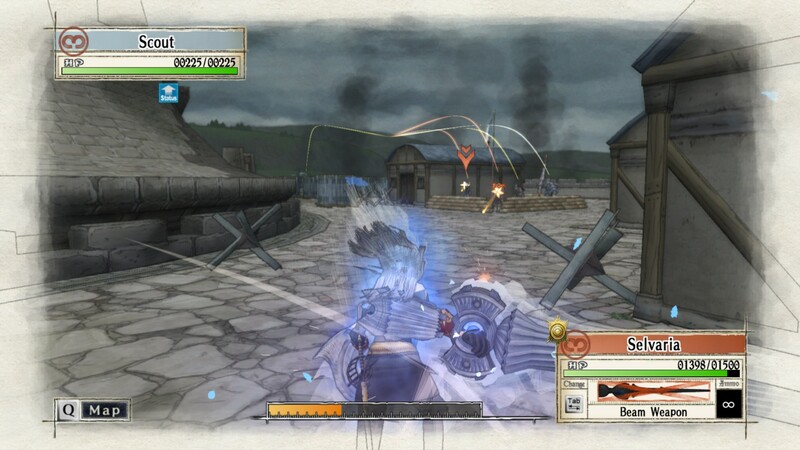 The scouts are excellent for locating enemies, and in Valkyria Chronicles 4, they seem more effective against shocktroopers than they did in Valkyria Chronicles. After pushing most of my forces to the open area, it was time to halt: enemy grenadiers appear, and their interception fire is deadly. Armed with anti-personnel ammunition, they can quickly destroy careless allied units. Riley’s actually less effectual in an anti-infantry role in that it’s simply not a good use of ammunition to have her deal with one infantry unit per turn, and I intend to specialising her for anti-armour combat once that becomes available. 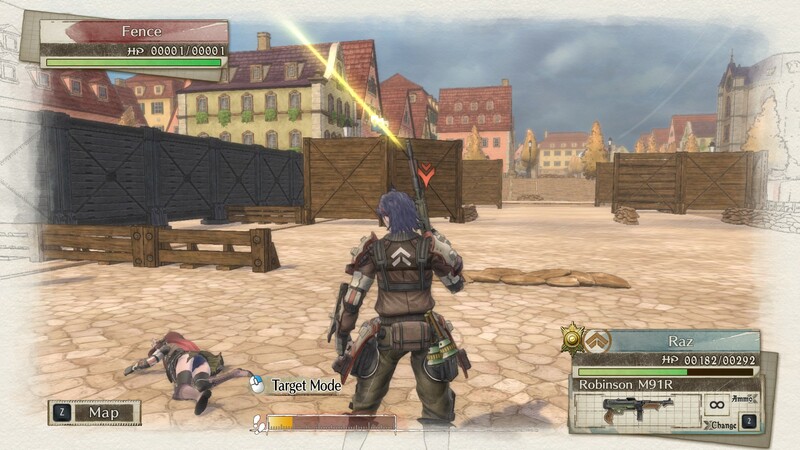 Downed characters in Valkyria Chronicles 4 must be evacuated, otherwise they become permanently dead, and in Valkyria Chronicles, I made it a point to evacuate everyone, even if it cost me a higher score. Later mechanics will introduce second winds and the like that allowed downed players to act, although I’ve not made use of this yet. The Siegval Line is a reimagined version of the Siegfried Line: it was built to counter the Maginot Line, and like its real-world counterpart, is heavily fortified. 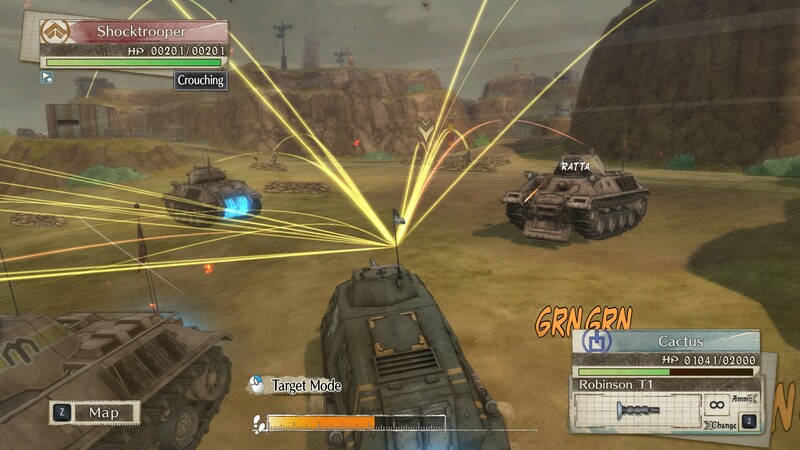 This mission introduces the armoured personnel carrier (Cactus), which allows players to transport allied forces to any part of the map without fear of being decimated by interception fire from small arms and Gatling guns. More lightly armoured than the Hafen, and having a longer range, it is great for getting through areas covered by Gatlings. The Cactus is equipped with its own machine gun, useful for softening up a capture point before disgorging its payload and allowing them to capture it. Using the Cactus allowed me to beat this mission in two turns without employing any of my other units, at the expense of doing very little damage to the enemy forces. The remainder of the operations at the Siegval Line were similarly straightforwards: a combination of scouts, use of the APC to deliver less mobile forces, and application of the Lancer class, allowed me to complete the next mission on very short order. I ended up using defense boost to advance one of my scouts to the enemy base, ignoring all enemies save those that stood on the base itself to finish the mission. 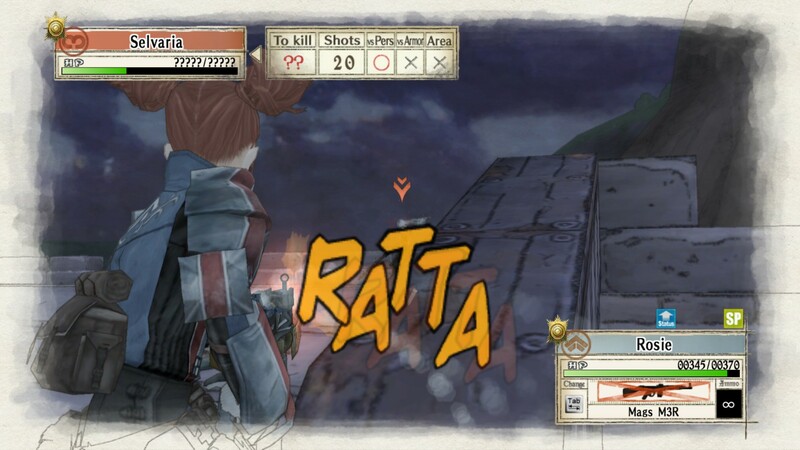 When Kai is injured by an enemy sniper, players must reach Raz and Kai to evacuate them. 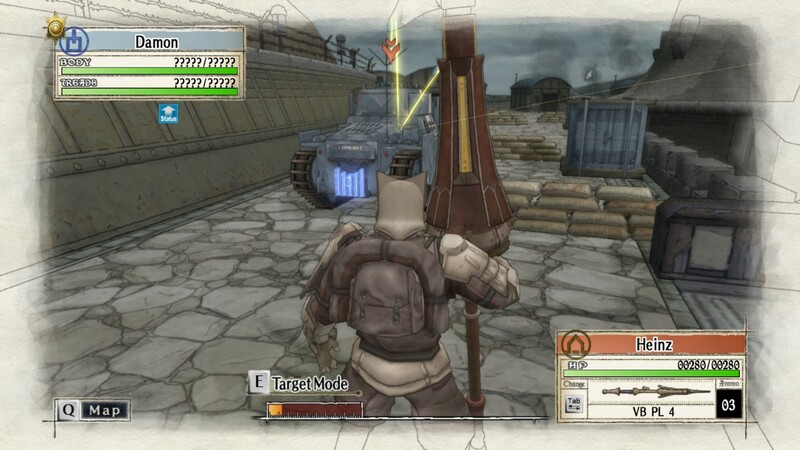 Klaus Walz’s Vulcan tank makes an appearance, although here, it is not a major factor: Riley is equipped with anti-armour shells and can deal enough damage to the Vulcan, removing it as as threat. 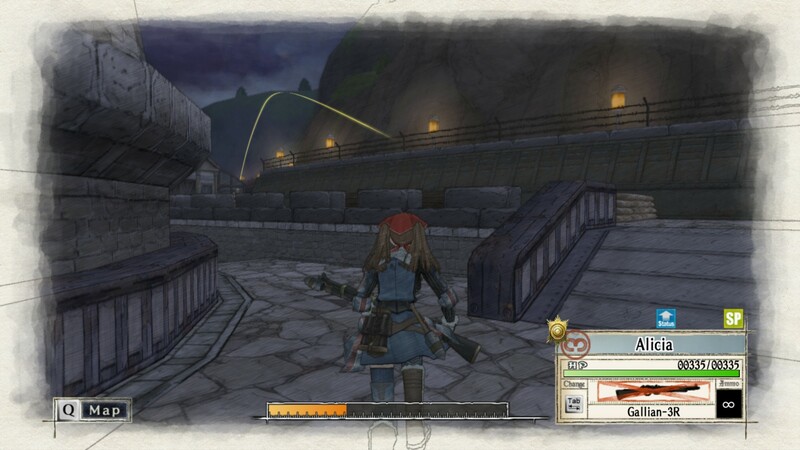 From here, use of scouts and cover from enemy grenadiers will allow Kai to be rescued. Lancers from Squad E have much sleeker-looking anti-armour weapons than did the lancers of Squad 7. 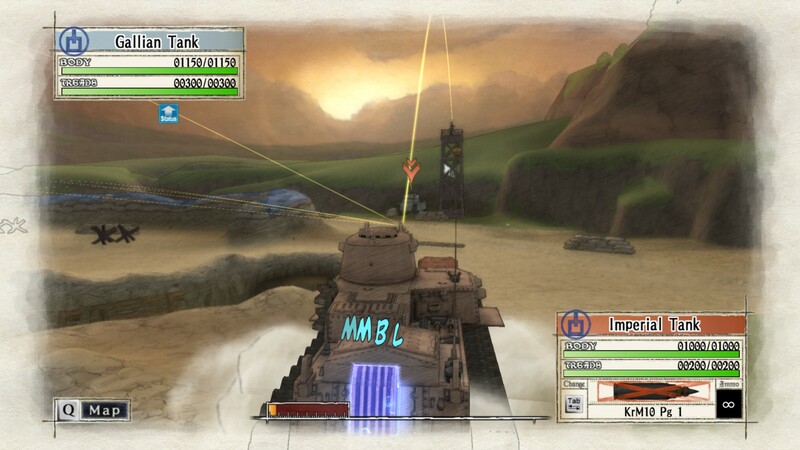 With the Siegval Line captured, Federation forces push into Imperial territory and reach a town. Their arrival is marked by the near absence of supplies and a cool reception from the citizens, although Claude and Riley are able to purchase Imperial provisions for repairing the Hafen. During this run, a dealer supposes that Riley and Claude are a couple. Elsewhere, Kai tries to rein in a furious Raz when they learn all of the bacon in town has been bought out, only to lose her cool when it turns out all of the bread’s gone, too. When it turns out Squad F was behind this, Kai and Raz challenge them to a faceoff. Claude accepts, and the condition is simple enough – capture three bases that Squad F holds before they can capture the two that Squad E holds. Utilising the scouts, I quickly captured the far right base, then the central base. When the far right base was recaptured, I sent one of my scouts to reclaim it, then moved another scout to the leftmost base. All of this was done within three turns, and by then, I had practically finished the “exercise”. However, I ended up deciding that, since I was here, I might as well blast Squad F’s tank to pieces and take a shot at wiping floor with Minerva herself. Squad F’s tank had made a beeline straight for my leftmost base during their turn, and so, I responded by moving the Hafen from the town square, bringing an engineer along with me to resupply and repair should things go south. I finished off Squad F’s tank off, and then turned my attention to Minerva. While she’s resistant to small arms, tank fire will damage her substantially. With this post on Valkyria Chronicles 4 nearly in the books, I remark that April has blazed by at a speed hitherto unseen, and today, I spent much of the day out and about: the Truck and Auto show was in town, and it was fun looking at the different vehicles, even though my heart is set on a Mazda 3. This was followed by an unconventional Easter dinner whose centrepiece was ginger-and-scallion lobster on a bed of sticky rice. I vaguely recall that the first time I started Valkyria Chronicles, it was after enjoying fried chicken poutine on campus and then spending a good chunk of the day setting up one of the old Mac Pros with a new GPU ahead of my work with Unreal Engine. It is humbling to know that the same engine that powered my Master’s Thesis also drives Ace Combat 7. 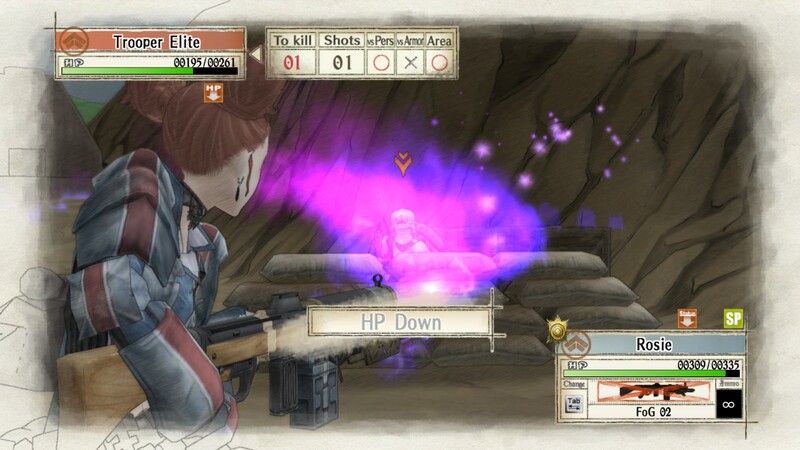 Back in Valkyria Chronicles 4, I’ll admit that I was not expecting this: after smashing Minerva, either a graphical glitch or dumb luck resulted in her pantsu being visible. With a handful of CP left after defeating her, I proceeded to finish off the mission without a hitch. So far, earning A ranks on every mission has been straightforward, although with the ominous winter settling in, Valkyria Chronicles 4 looks to ramp things up. I know that there will be surprises in store for me as I push further into the game, and a part of the fun will be seeing how my über micro stacks against whatever’s in store for me. I picked up Valkyria Chronicles 4 during the Winter Sale, but owing to my schedule, I never got around to starting until after I’d beaten the campaign for Senran Kagura: Peach Beach Splash and Ace Combat 7: Skies Unknown. Now that both titles are under my belt, I’ve begun, and having put six hours into the campaign, I find myself immediately at home with the mechanics, progression system and scoring. The major difference is that system keys cannot be customised, meaning that the space bar I used to advance scenes and activate sequences can no longer be used. 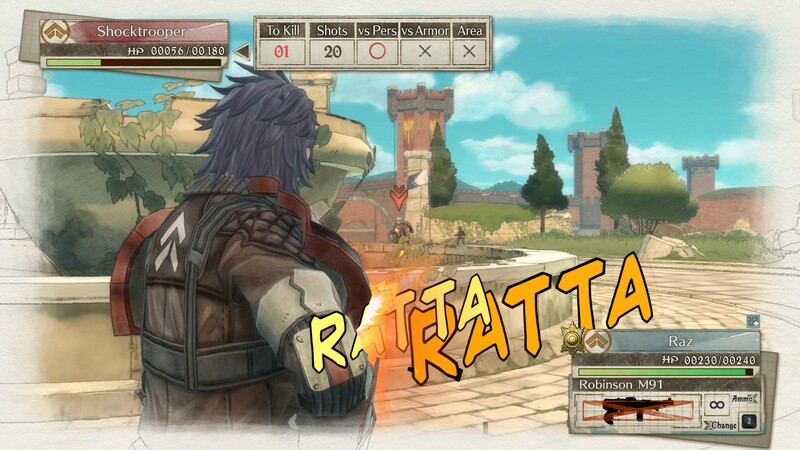 It takes some getting used to, but beyond this, Valkyria Chronicles 4 handles like an old friend. By making use of the Headquarters earlier on, I can give my classes more advantages and unlock orders; I’ve not put them to much use as of yet, nor have I attempted the old order stacking tricks, Valkyria Chronicles 4 remains as fun as its predecessor. With improved movement and upgrades to the Canvas Engine, visuals look slightly more impressive than they did, and the game handles very well. 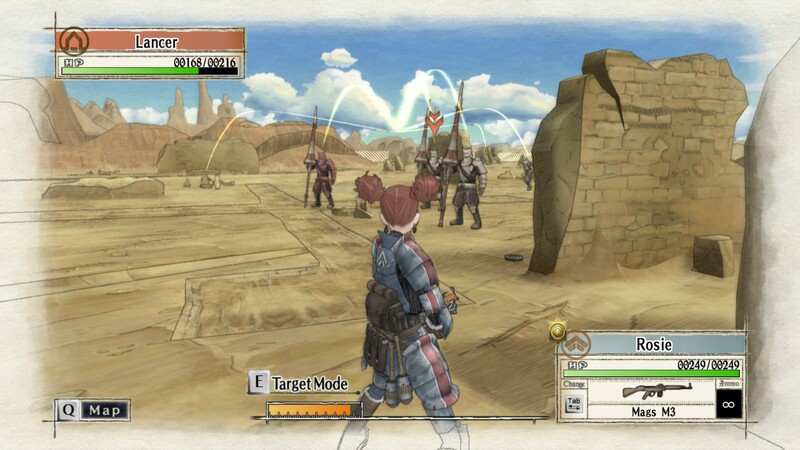 Insofar, I’ve not run into the first mission that sent me packing: back in Valkyria Chronicles, the appearance of the Batomys during the Barious Desert campaign completely shut me down, and it took me the better part of ten months to get back into the game. 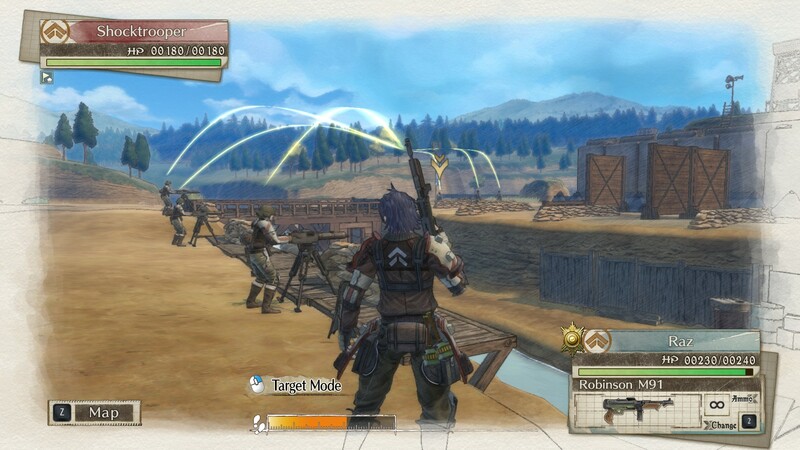 I anticipate that there will be a similar mission upcoming that will similarly vex me, but this time, I am equipped with the expectation of increasingly challenging missions that will test me – with a stronger grasp of the mechanics compared to when I first played Valkyria Chronicles, I’m ready to take on whatever comes my way. In Enter the Edy Detachment, Edy Nelson and her squad are separated from Welkin’s group. While moving their way back, they come across a village held by Imperial force. Lacking armour and more firepower, Edy decides to have her group hold the Imperials off long enough for the villagers to evacuate, and after learning that Rosie needs assistance, Edy moves towards helping her out. Edy’s mission is short, simple and provides a bit of fun for players. Selvaria’s Behind Her Blue Flame campaign, on the other hand, follows her operations with Imperial engineer Johann Oswald Eisen, a timid soldier whose experiences lead him to become more capable. Here, Imperial forces make to capture the Ghirlandaio Citadel from Gallia. 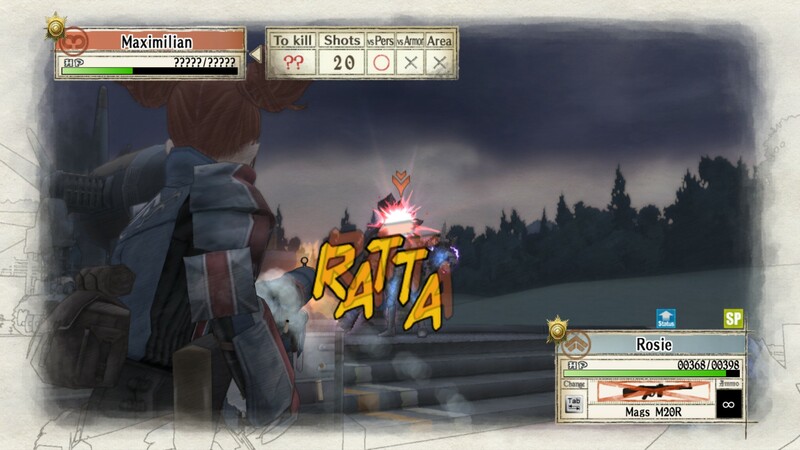 Because Selvaria is adverse to Ragnite weapons, Johann works with her to advance, allowing them to take Ghirlandaio. General Damon is shocked and orders the use of chemical weapons, which disable Selvaria. Johann comes to her aid, and fully recovered, Selvaria again lends her considerable skills in combat towards an Imperial victory, driving off the Gallian forces and General Damon to secure Ghirlandaio Citadel. In the aftermath, Selvaria shares a meal with Johann as thanks, and Johann decides to become a scout, inspired by his time fighting under Selvaria’s command. The full-fledged campaign in Behind Her Blue Flame will award players with the Ruhm, Selvaria’s personal weapon, and the tenacious can also unlock an additional level, in which they can play as the Imperial Alliance’s most lethal soldier with her Valkyrur powers unlocked. Enter the Edy Detachment offers very little by way of story, save a bit of humour, but Behind Her Blue Flame is quite the opposite, providing players with a profound experience from the Imperial Alliance’s perspective. 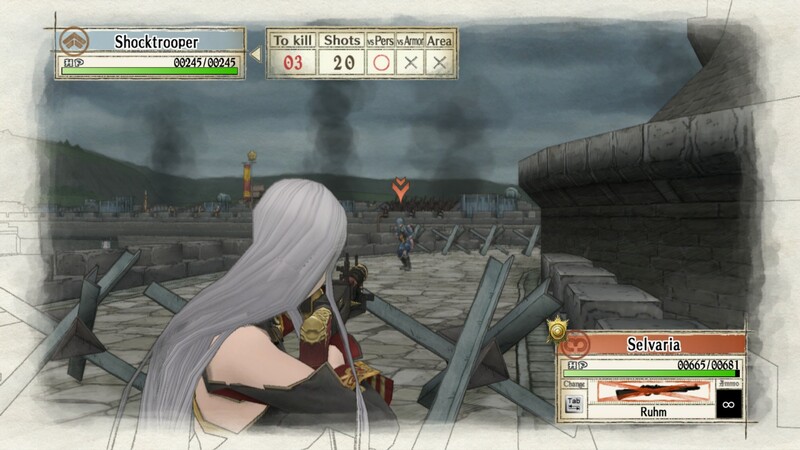 Having long played for Gallia, it was very refreshing to play Valkyria Chronicles as the Imperials. 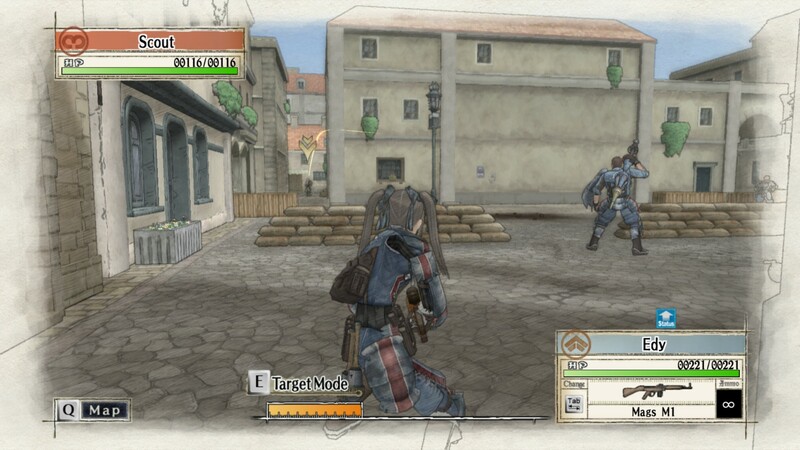 The nameless soldiers that Squad Seven had slaughtered wholesale during Valkyria Chronicles‘ campaign are given human attributes and backgrounds – they are no longer nameless and inhumane. 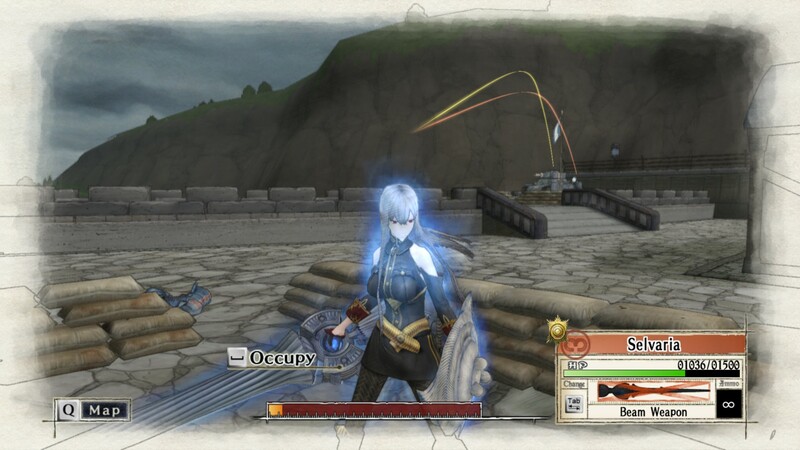 Valkyria Chronicles presented Maximillian as a despot bent on conquering Europa without a concern for his subordinates, but Behind Her Blue Flame illustrates that Selvaria, despite her Valkyrur origins and utmost devotion to Maximillian, is as human as anyone else, caring about those under her command and constantly striving to accomplish whatever goals are assigned to her. In her downtime, she cooks and maintains her appearance, and is not immune to moments of embarrassment, either. Similarly, while players have long seen Gallian forces as the protagonist, watching General Damon’s incompetence and reliance on WMD show that Gallia’s military also has immoral elements. Consequently, it was superbly entertaining to destroy his tank and watch as he loses composure while Selvaria and Johann best him. 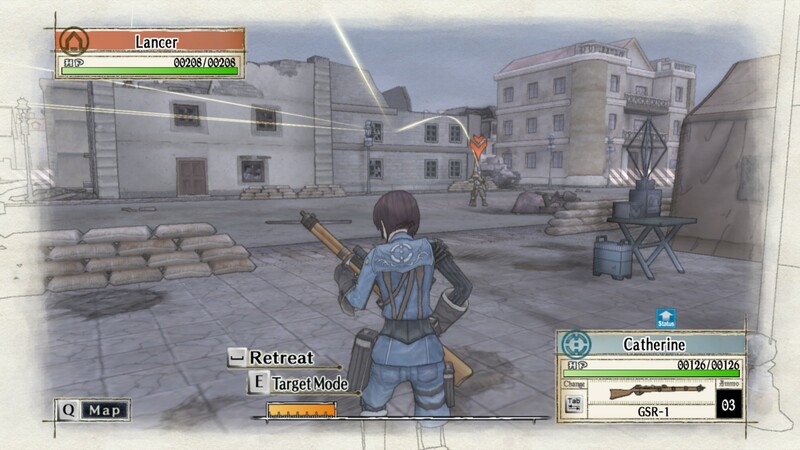 The Behind Her Blue Flame missions excel at presenting Imperial soldiers as people and that wars are ultimately fought by human beings: in providing players a chance to see things from the antagonist’s perspective, things in Valkyria Chronicles no longer seem so black and white. There’s a fun aspect about Edy’s character, and I personally found her to resemble Kantai Collection‘s Zuikaku in appearance and manner; both share the tsundere personality. Edy’s mission is a simple one: hold off Imperial Forces and then reach the marked point before one exceeds a certain number of turns. This mission, however, proved much more difficult than the campaign missions in that orders are not available. Before we continue further, I remark that I played through the Edy Detachment campaign back during January of 2017 – I am very bad when it comes to recreation, so it takes me forever to finish something. With this being said, once I start something, I will finish quite quickly. The Edy campaign (not to be confused with her challenge missions) is a short one that offers no unlocks, but offers players a chance to see how the show is run when Welkin and Alicia are not around. 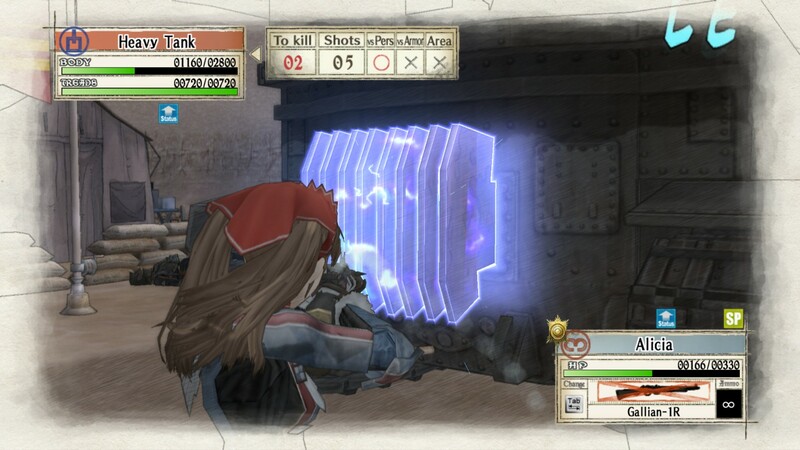 I ended up beating this mission with a B rank: not particularly impressive, but I note that at that time, I had not played Valkyria Chronicles for upwards of six months. The reason why I did not have a separate post for Edy’s mission was because it was comparatively short, and so, there was not enough content for me to do a separate talk on things. As such, I decided to merge the post together with Selvaria’s missions. Selvaria’s missions, unlike Edy’s, features exceptionally strong writing and solid character development despite its short runtime. Players will have access to Selvaria, a veritable one-woman army, and several Imperial units to command. The gameplay is identical, although as one of my readers mentioned in a comment I can’t quite find, the Imperial soldiers are not particularly durable and should be used with caution. 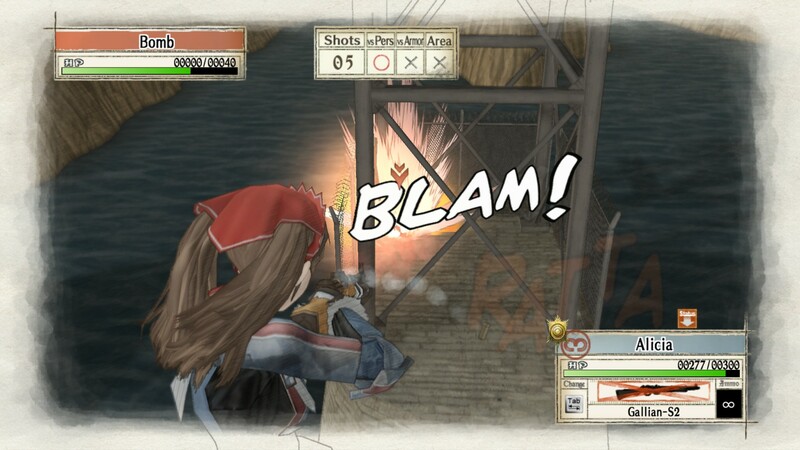 By comparison, Selvaria is a beast: Ruhm is Valkyria Chronicles‘ equivalent to Halo‘s pistol, a weapon so infamous that it has been more or less immortalised in gaming history as one of the greatest overpowered weapons of all time. I loved Johann’s story – a timid soldier, his time with Selvaria transforms him into a determined soldier devoted to his duty, and he also changes roles from the support-oriented engineer to a scout. Most of my strategy in Selvaria’s missions were to move Selvaria forward, and then move Johann up to provide support for her. I was therefore able to finish the first mission on short order, and decided to not go for Damon’s tank on the far corner of the map. Even without demolitions boost, the Ruhm is powerful enough to ruin the Gallian tanks in one action. Gallian light armour is actually quite powerful against the light tank players are given, being able to take out most of my health in one shot, and as a result, I’ve had a few attempts that saw me lose my tank. Selvaria might not have demolitions boost, but her orders to increase defense are immensely powerful and allow the otherwise fragile Imperials to survive interception fire more easily. Besides providing a solid bit of background for Selvaria, the fact that she’s not fond of Ragnite-based weapons means that she’s also unable to wield grenades and break down the barricades blocking her path. This forces players to use Johann to support her: as an engineer, he has access to three grenades per turn, which are utilised to clear barriers. The result is a very unique dynamic between Selvaria and Johann: as powerful as Selvaria is, she simply can’t clear the barriers on her own and is entirely dependent on Johann to help her. Other soldiers, though capable of carrying grenades, do not carry nearly as many. 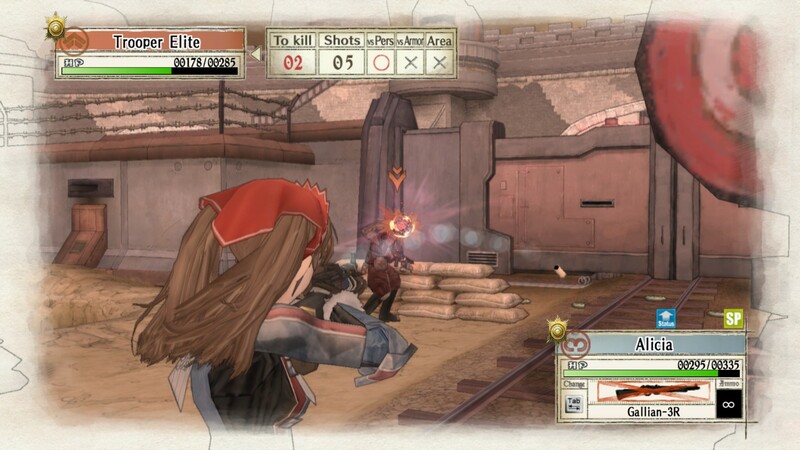 The DLC missions show that the Gallian army is not above using WMDs to accomplish their aim: while Valkyria Chronicles presents the Imperials as soulless invaders, the DLC illustrate that the host of soldiers Squad Seven wade through are also people, with families and dreams of their own. It was therefore a bit unexpected to see Damon deploy Ragnite Gas, a nerve agent, against Imperial Forces. This leaves Selvaria immobilised, and so, on the second mission, the goal is to get Johann to her: he’s carrying an antivenin to Ragnite gas. Because I did not destroy Damon’s tank on my first run, I ended up with “Rout of the Gallian Forces”, where the central gate is closed. The left flank on the map is weakly defended, and after I captured one of the bases to prevent Gallian forces from storming in, I managed to reach Selvaria in two turns. Fortunately, by eliminating nearby hostiles, Gallian forces were not able to capture her, and once I had Selvaria back in commission, it was a simple matter of boosting her defense with an order and sprinting to the end of the map to capture the base. While the other Imperial units besides Selvaria are very weak defensively, their offense is acceptable, and they should not be ignored: they can be used to capture bases, eliminate hostiles and provide additional command points to make the missions easier. Beating any two of Selvaria’s missions will unlock the Ruhm for use in the full game, and this weapon, like the Federov Avtomat, is a game-changer, turning any shocktrooper into an assault rifle-wielding beast. Specialising in close quarters engagements, shocktroopers usually wield submachine guns, fast-firing automatic weapons that fire 9 mm pistol cartridges. Because the Ruhm is chambered for the 7.62 mm round and is characterised as a versatile, infantry-portable weapon, it handles more similarly to an assault rifle. Against all but the most distant of foes, and foes behind cover, the Ruhm is able to dispose of enemies with ease. After completing Behind Her Blue Flame once with any score, on either of the two possible second missions, will unlock the Ruhm for use in the campaign, but there’s a reason why I went through things again. On my first run, I was not particularly focused on destroying Damon’s tank, since I simply needed to get the second mission done. 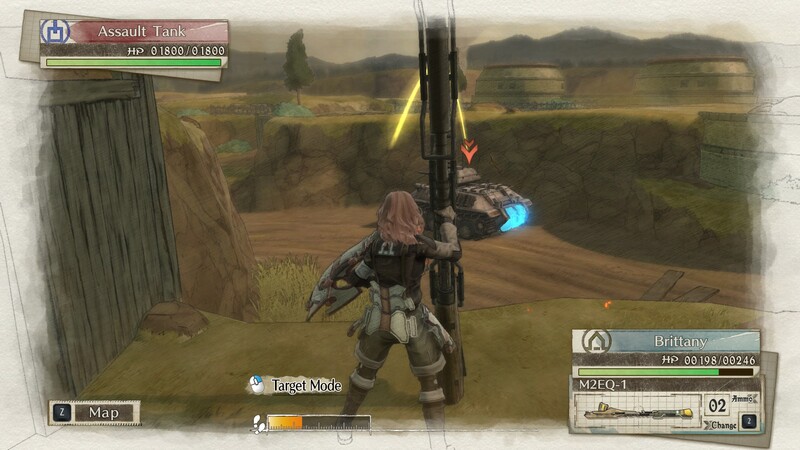 While guides maintain it’s a bit tricky to get Damon’s tank in three turns, Selvaria and Johann can be moved quite far. The trick to eliminating Damon’s tank is to know where it is located, and once found, it’s a matter of clearing all Gallian forces out and pulling one’s lancers back to keep them alive for the next turn, redeploying them at a capture point closer to Damon’s tank. Eliminating Gallian units also reduces their number of command points, so once their turn ends, and the player’s lancers spawn in, it’s a simple matter of running around the corner and smashing Damon’s tank with a single shot to the thermal exhaust port radiator. 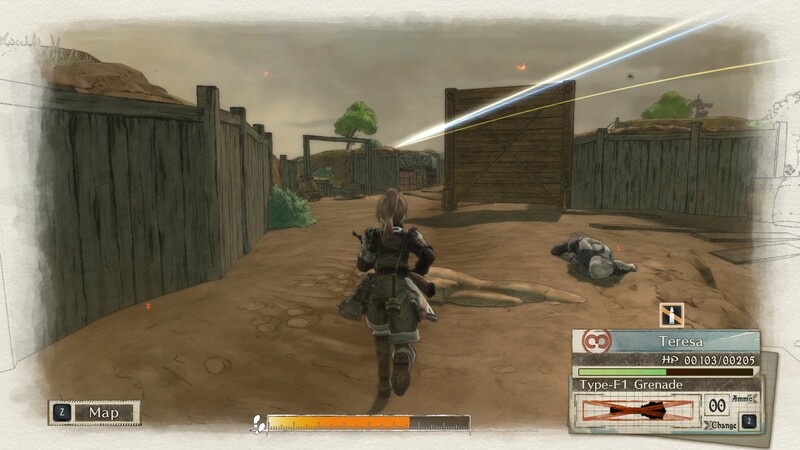 Once Damon’s tank is destroyed, he will pull back, and it’s a quick finish as Selvaria and Johann push forwards to capture the required objective. Taking out Damon’s tank causes him to retreat and order a strike on Ghirlandaio: this has a tangible effect on how the second mission turns out, and in my opinion, this actually results in an easier second mission: the main gate is opened, and while Damon will use artillery to try set off ammunition stored at the facility, this won’t occur early on in the mission. 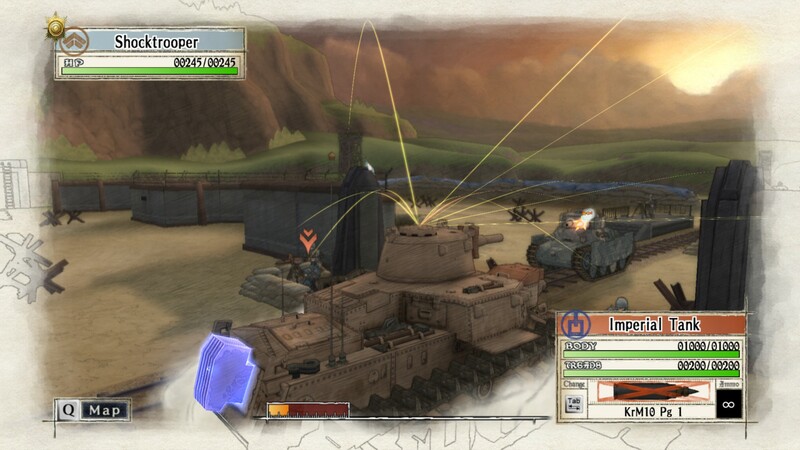 The first action is to move the Imperial tank up, and subsequently eliminate the Gatling guns. Keeping the tank up here at close range also allows for Musaad the Mole to be eliminated by Gallian interception fire alone. I’m not sure if this is a bug or feature, but it does allow players to take out a Gallian elite unit without much difficulty. Some patience will be required, since the interception fire won’t deal a high amount of damage, but it’s worth the wait. 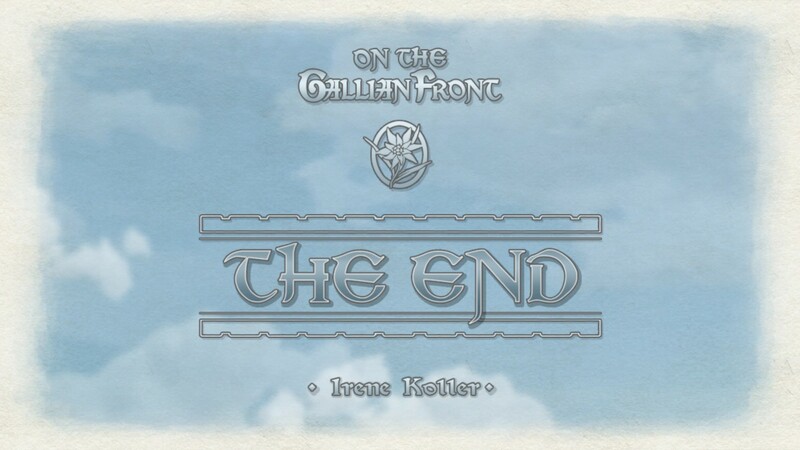 Pushing through the remainder of the mission is very straightforwards once the tank is moved ahead: after Johann reaches Selvaria, it’s game over for the Gallian forces. 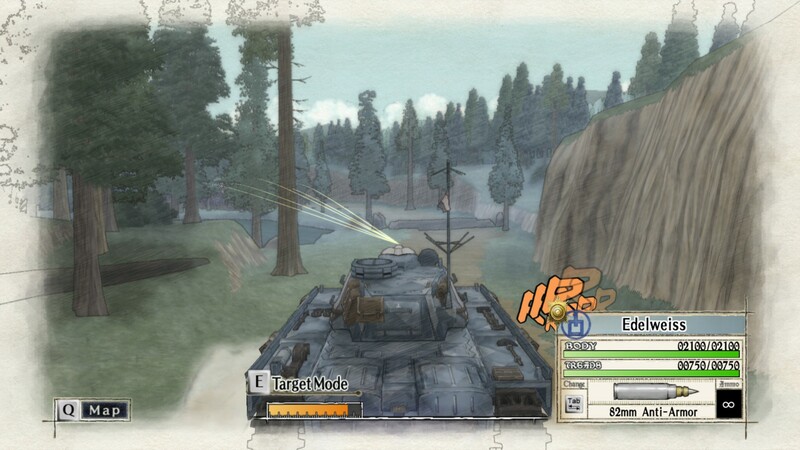 As such, I will now go on a tangent and consider Girls und Panzer: Dream Tank Match, which prima facie has a very similar set of mechanics to Valkyria Chronicles. Unfortunately, despite having a full English version, it’s only for the Playstation 4, and as such, is something that I won’t be able to experience unless I drop some coin for a console. This is a bloody shame, and as far as I’m concerned, a terrible business decision: locking out a PC version isn’t going to convince PC gamers to cough up for a Playstation 4 and reduces sales overall. I have long been waiting for a chance to apply my own brand of strats to schooling the Nishizumi Style, and to be denied this is somewhat disappointing. Of course, if a PC version ever does become available (likely, after Half-Life 3 is released), I would not hesitate to buy Dream Tank Match at full price, if only so I could take proponents of the Nishizumi Style to school. There are other games to be enjoyed in the meantime, so I won’t worry too much about the fact that I probably will not be playing Dream Tank Match without a Playstation 4 for the present, and return to Valkyria Chronicles, where I’ve been given access to Selvaria’s Valkyrur powers, having beaten all of the other missions with A-ranks. As a Valkyrur, Selvaria has access to the incredible powers afforded by a Valkyrur lance. 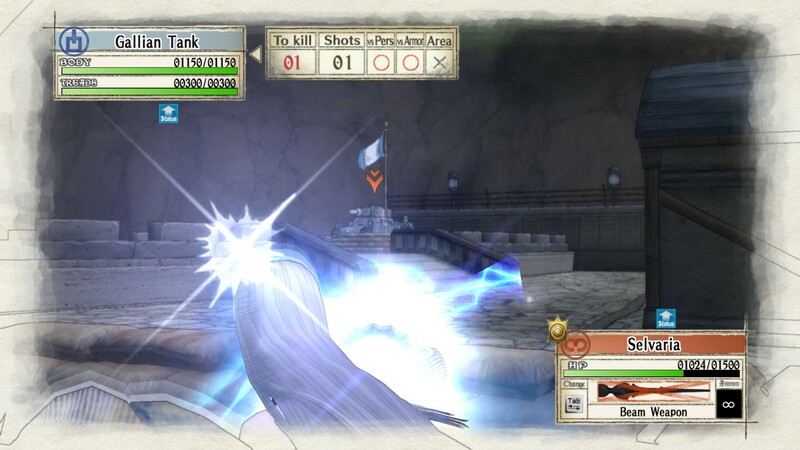 In addition to a Gatling beam mode, which she made use of during the Barious mission, Selvaria’s lance also has a single-shot beam that can eliminate anything. The beam weapon is capable of of melting multiple tanks in a single shot, putting it on par with Halo 3‘s Spartan Laser: with this much firepower, and the object of the final mission being simply to eliminate all Gallian forces, Selvaria’s final mission is remarkably straightforwards and perhaps the very best definition of what proper fanservice is, being something that appeals to the viewer in some way. While Selvaria’s assets might just be why she’s so favourably viewed, I personally enjoyed her story and in-game performance to a much greater extent. 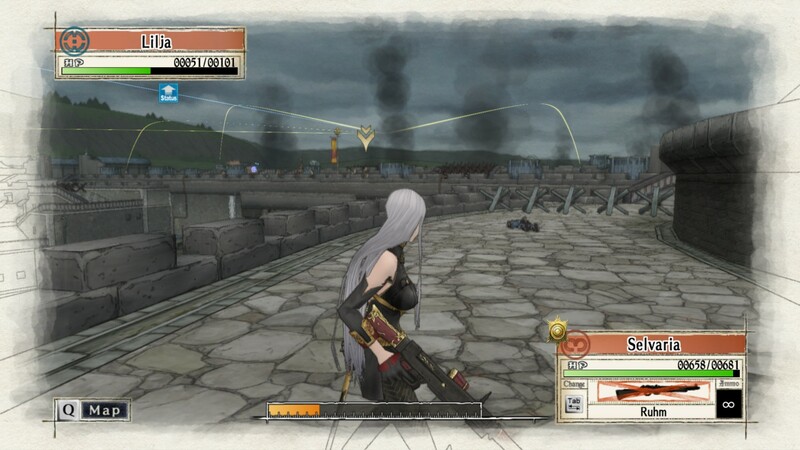 I’m glad that Selvaria was not implemented with deformable object physics. Beyond being a visual distraction, ill-implemented approaches can also be resource intensive. It’s been a shade less than three years since I write about Valkyria Chronicles for the first time : back then, I had just finished setting up an upgraded computer ahead of my work with the Unreal Engine and spent the afternoon eating a fried chicken poutine while talking about a seminar I’d attended with my supervisor. Presently, I’ve enjoying a quiet evening following a dinner with an extra-crispy, spicy fried chicken, and it’s the middle of tax season. Some things have changed in the three years that’ve passed, such as my volunteering as a judge for a local city-wide science fair, and others have remained the same. So, about a year and a third after I began the DLC, I’ve finished the campaign segments of Valkyria Chronicles, and I might return to the main game to beat it a second time as time allows. Of course, seasoned readers will know by now that whether or not this will happen is entirely up in the air, to be determined as time allows. With this being said, however, there are some things that are not so uncertain; I will be writing about Comic Girls and Amanchu! Advance after their respective third episodes have aired, and I have tenative plans to review Fireworks, Should We See It from the Side or the Bottom? (Uchiage Hanabi, Shita Kara Miru ka? Yoko Kara Miru ka?) once its home release is available. 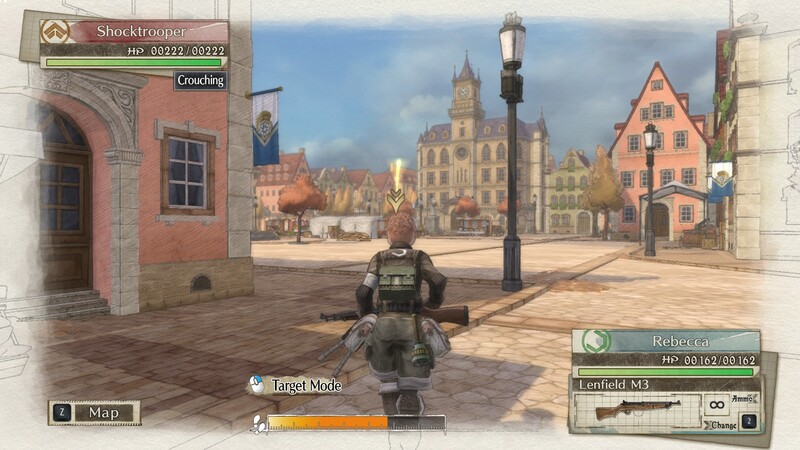 Having completed the campaign-driven DLC missions of Valkyria Chronicles and unlocked the Ruhm, I’m now back into Valkyria Chronicles‘ new game mode, which allows me to replay old missions and make use of all of my unlocks. 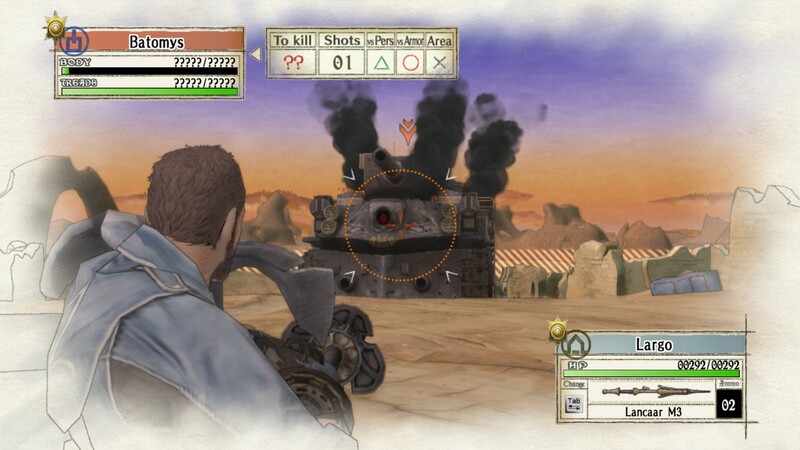 It’s been nearly a decade since Valkyria Chronicles first released in Japan for the Playstation 3, and despite its age, Valkyria Chronicles has aged very gracefully. 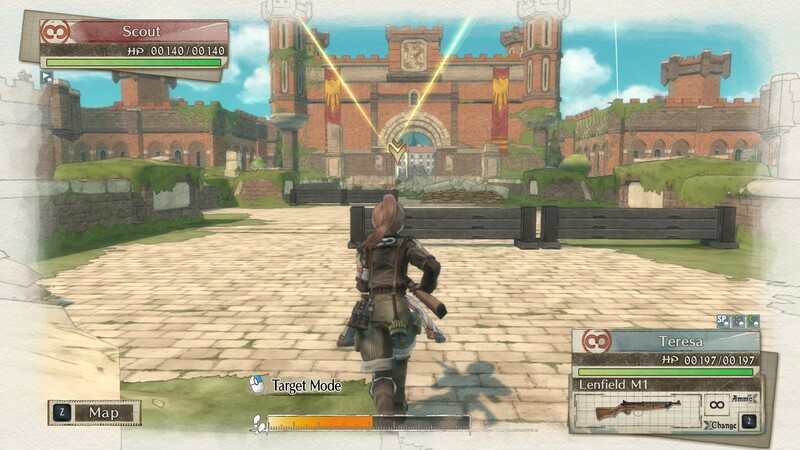 The pencil sketch-like visuals, made possible by the CANVAS Engine, gives the game a timeless feel, as does the setting, and as such, even against modern giants like Battlefield 1 and Far Cry 5, Valkyria Chronicles continues to look and feel amazing. While the gameplay has become a bit dated (movement and aiming is a little unwieldy), the mechanics largely feel smooth and responsive. 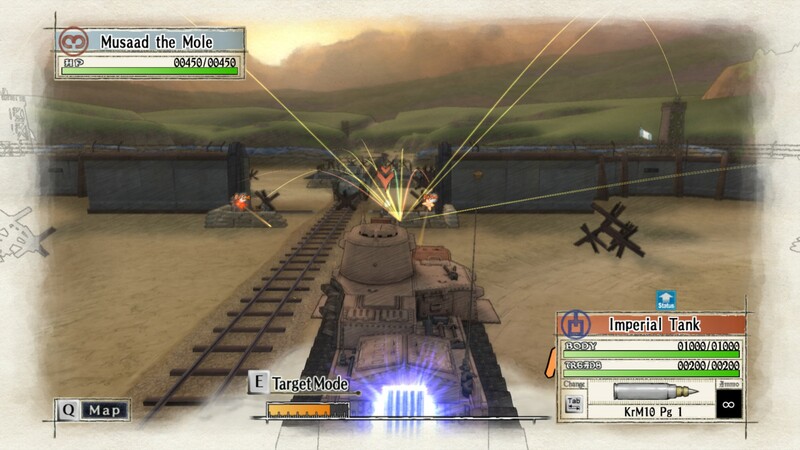 My story with Valkyria Chronicles began with watching the anime some years ago: after Girls und Panzer ended, I was looking for an anime that provided similar armoured combat, and Valkyria Chronicles was one series that seemed to fit the bill. 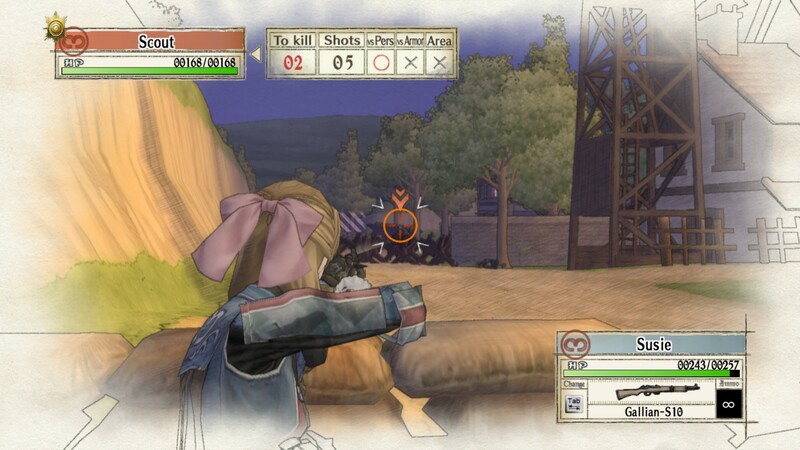 I left the anime largely impressed and picked the game up for PC once it became available, and since then, Valkyria Chronicles has become one of my favourite games of all time for its superb narrative, world-building and gameplay, representing the a game that has found the perfect balance between Only In Battlefield™ moments and story. 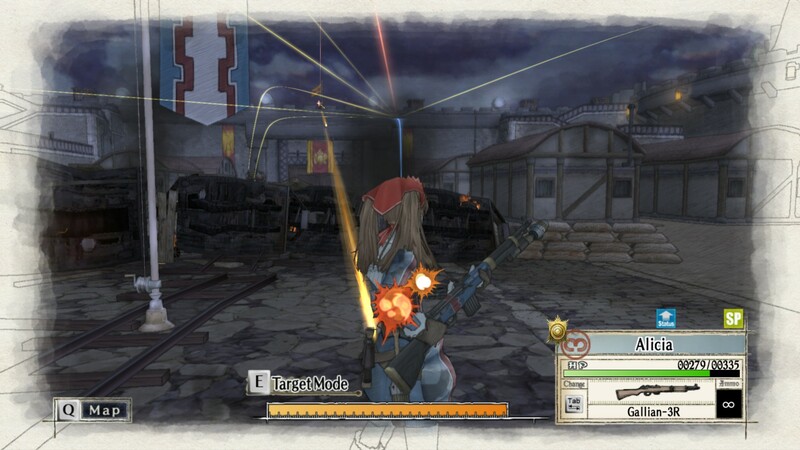 The DLCs further bolster the game’s enjoyment factor, breathing additional life into a well-written world, and my procrastination abilities notwithstanding, I’m glad to have taken the time to take a look at Valkyria Chronicles‘ campaign DLC missions. 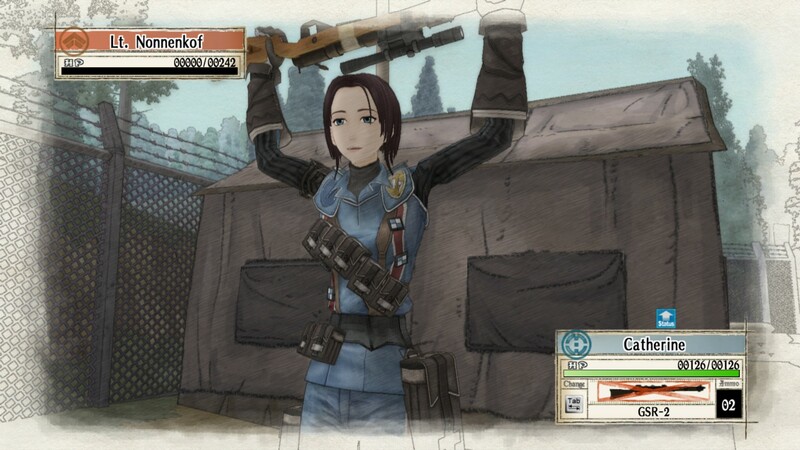 Officially, I completed Valkyria Chronicles on the Friday evening leading up to the Victoria Day Long Weekend. Pushing my way through Citadel Ghirlandaio, it was a quick fight to open the rail switches and deliver an explosive device to crack the fortress’ gates. 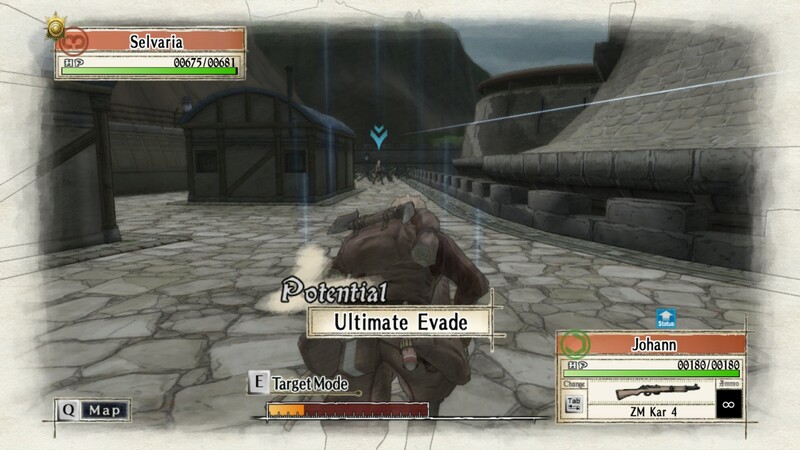 Once inside, I turned Squad Seven’s attention towards defeating Selvaria. Even as a mere mortal, Selvaria has a high health pool and is armed with the Ruhm, an exceptionally powerful weapon with the accuracy of a sniper rifle and firing rate of a submachine gun. However, my own forces were well-equipped to deal with Selvaria, and after capturing bases close to the Selvaria’s position, orders used in conjunction with Rosie ended that fight. Shortly after, Squad Seven is sent to divert the Marmota, a massive land dreadnought, and later, return to the Great Vasel Bridge for one final confrontation with General Jaeger. 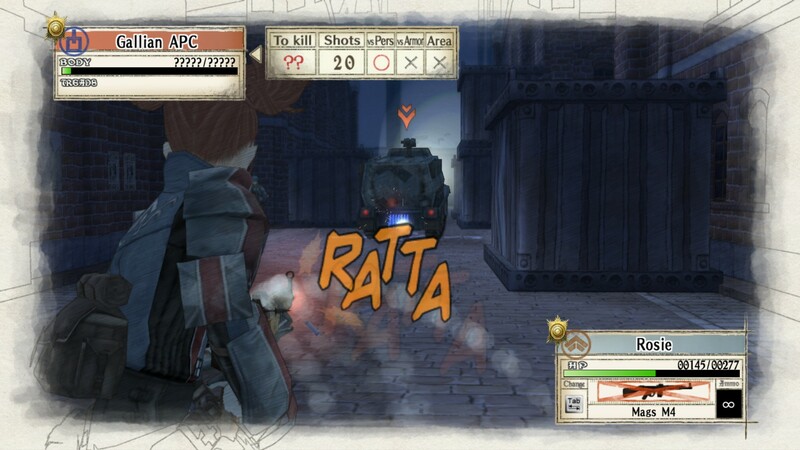 Besting his tank, Valkyria Chronicles sends Squad Seven on one final mission to stop the Marmota and defeat Maximilian. Despite his powers as an artificial Valkyrie, this mission was completed on short order, as well, and I sat back to enjoy the ending credits as rain began falling outside. After some forty-one hours of time spent in-game and 1.5 years having elapsed since I first bought the game during the Steam 2014 Winter Sale, I’ve finally finished my first play-through of Valkyria Chronicles. 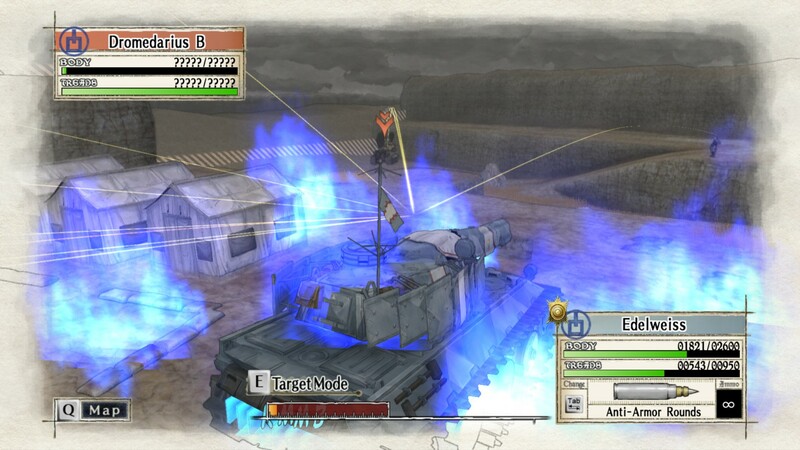 Unsurprisingly, the major thematic element in Valkyria Chronicles is one that figures greatly in Girls und Panzer; strength of arms and brute force are not infallible against the resilient spirit of those who have a powerful reason to fight. General Jaeger outright says this to his men before taking his leave, learning that the Gallians are so effective is because they are fighting to defend their homes. 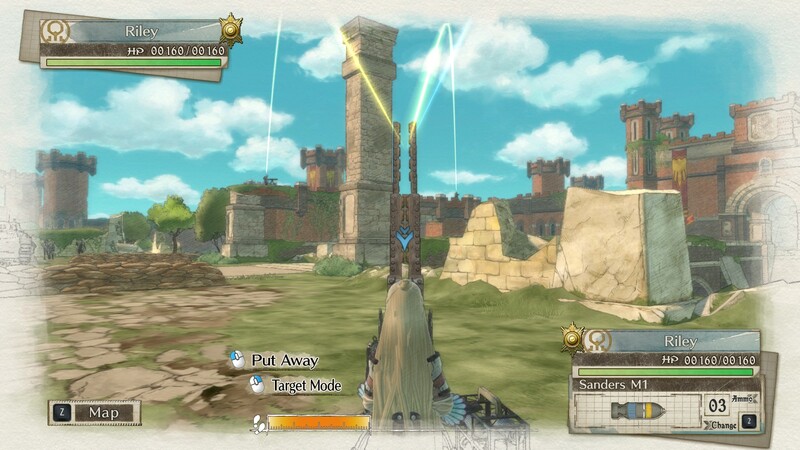 Similarly, Welkin reminds Maximilian that power alone is meaningless; after learning that Alicia is a Valkyrur, he nonetheless chooses to field her as a conventional scout, counting on Squad Seven’s experience and resolve to turn back Maximilian’s war machine in place of the easier route of having Alicia wield her Valkyrur powers. These themes are mirrored throughout Girls und Panzer, and it is perhaps for this reason that Valkyria Chronicles and Girls und Panzer wind up being similar enough for it to have been a recommended anime for me. Back during May 2013, after I had completed Girls und Panzer, I was looking for a similar anime. My initial impressions were that Valkyria Chronicles‘ anime incarnation was dramatically different in setting and narrative, only overlapping in terms of armoured combat. However, now that I’ve beaten the game, these differences are no longer so pronounced. 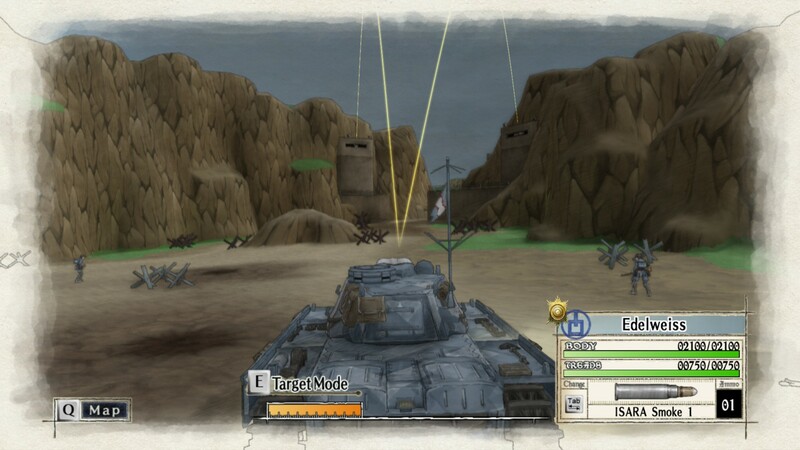 Both Girls und Panzer and Valkyria Chronicles‘ game incarnation have a powerful narrative about how individuals fighting to save what they hold dear to them triumphs over firepower alone. Similarly, both have a diverse cast that takes some time to get used to, but contribute substantially to the sense of unity and determination amongst the characters. 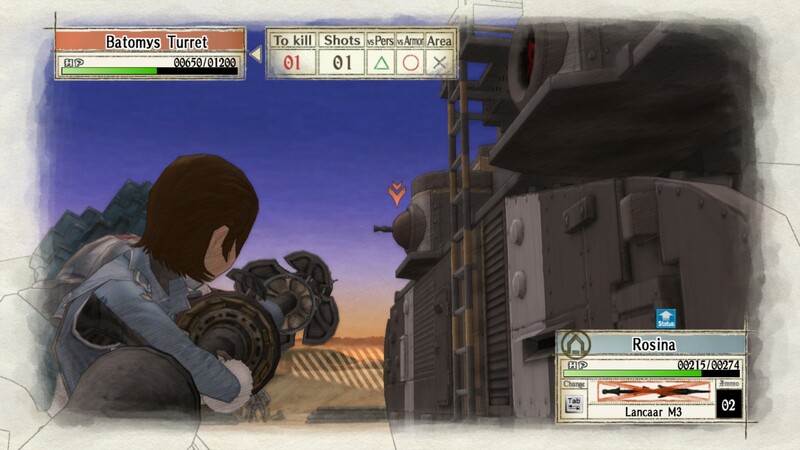 While Valkyria Chronicles‘ anime does not capture this theme quite as effectively as Girls und Panzer, the game certainly succeeds; it presents a combination of narrative, emotional impact and gameplay that is successful in captivating the player. 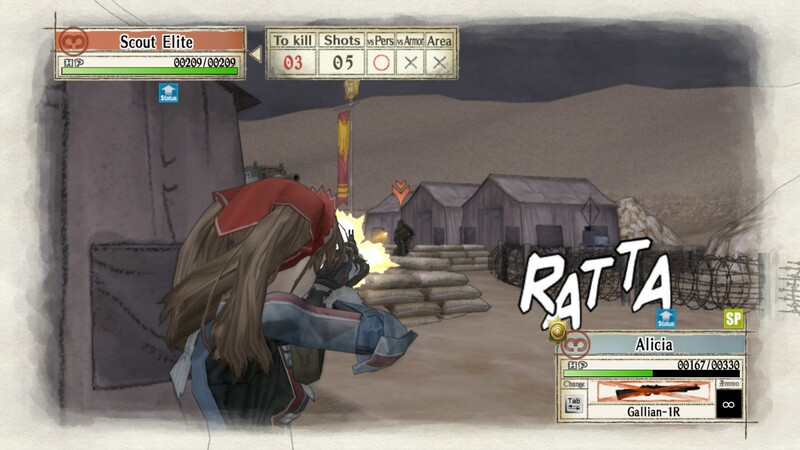 We come to it at last, the final post I will do on Valkyria Chronicles‘ main campaign. I do plan on going through and beating all of the DLC, plus playing through the entire game again to grab all of the A-ranks for each mission at some point in the future, and I imagine that now armed with orders and maxed out characters, this is going to be a walk in the park. Demolitions boost in conjunction with defense boost and awaken potential on Alicia turns her into Halo‘s Spartan-117 in terms of lethality: tanks without armoured exhaust vents can now be destroyed in a single action, since Alicia has the mobility to flank the tanks and move around them to reach the exposed vents. Activating her potentials means she further takes on the Master Chief’s capabilities: with her double movement, resist crossfire and mysterious body potentials, Alicia can cover a vast amount of ground, shrug off otherwise-lethal shots and regenerate her health. With all of these elements together, I finished the first mission at Citadel Ghirlandaio in two turns, making extensive use of Alicia to activate the rail switches and subsequently deliver a bomb that would blast open the fortress’ main gates. 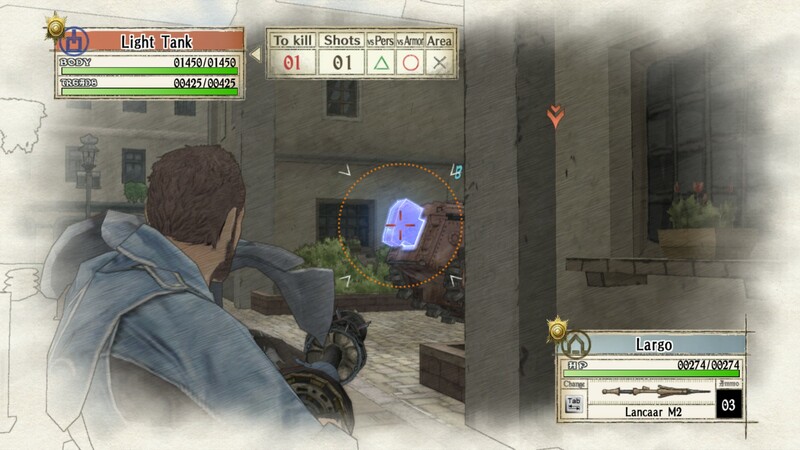 In the absence of orders, Valkyria Chronicles becomes much harder; in addition to scoring A-ranks on each mission, it will also be fun to see how much forward thinking and strats will be needed to score A-ranks without using orders. 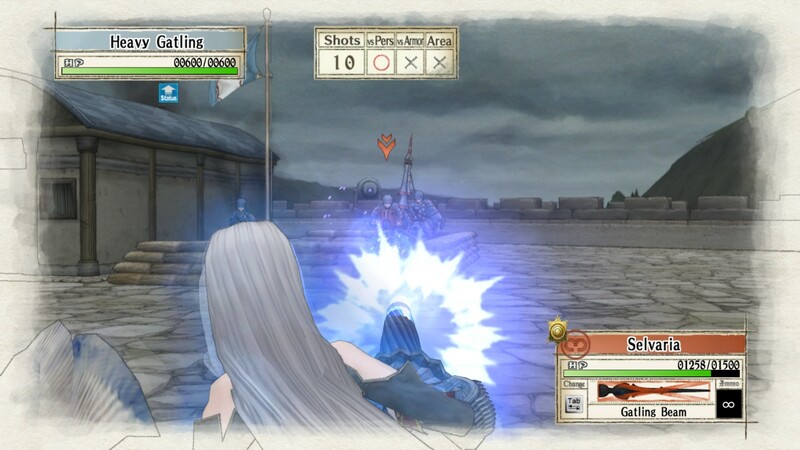 The second Citadel Ghirlandaio mission involves a duel with Selvaria herself. 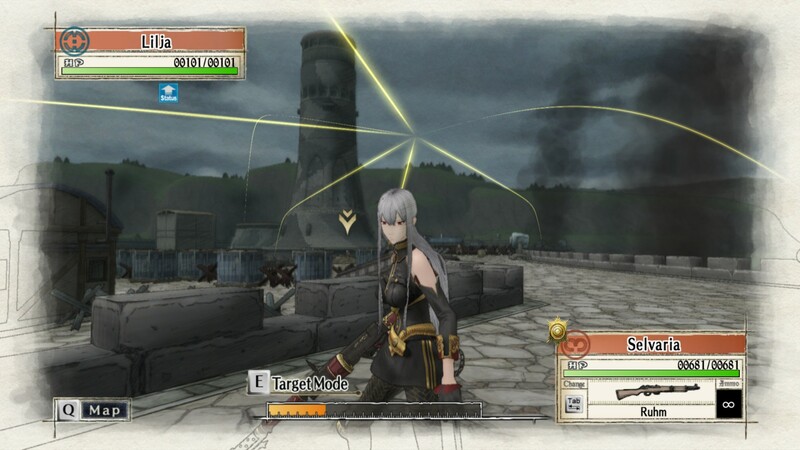 Although possessing the Ruhm, Selvaria does not use her Valkyrur powers here. I made use of cover to capture the bases to the right side of the map, with the intent of calling in shock troopers as reinforcements so they can engage Selvaria. 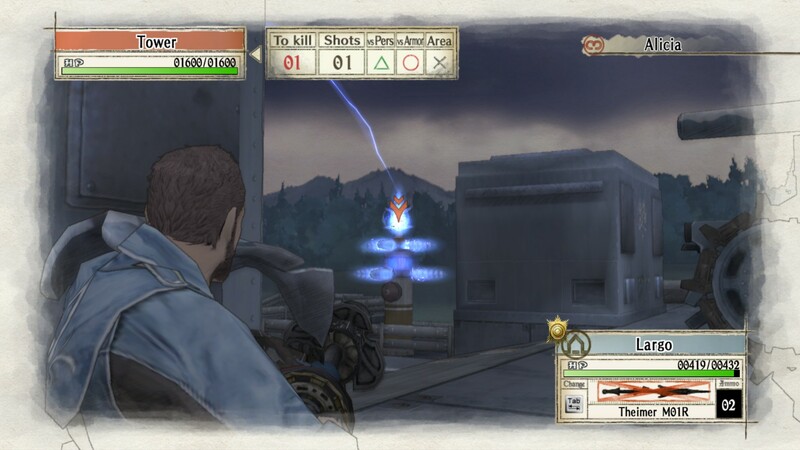 Like Wolfenstein: The New Order, each mission in Valkyria Chronicles is memorable, being set in a different setting with a unique atmosphere and feel to it. The presence of full cutscenes and narrative styles inspired by kinetic novels, the story was actually quite compelling to read through and experience, giving each mission additional weight. This approach also strikes a fine balance between excitement and tedium: the game allows players to progress in a more relaxed manner compared to something like a shooter, but is also more engaging than reading text on a screen. 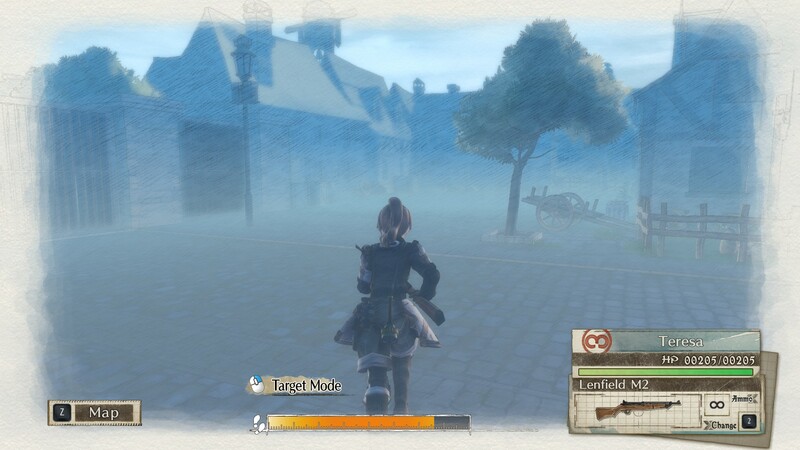 One of my original strategies was to deploy the Edelweiss and have it cover the area in smoke so that my shocktroopers would have an easier time attacking Selvaria: she does not dodge shots fired from behind and this would have ended the mission quite quickly. However, Selvaria moved before this plan could be executed. Here, I take advantage of the Edelweiss to destroy an enemy heavy tank, and it appears that I’ve captured one of the Edelweiss’ piercing rounds leaving the barrel to impact the enemy armour’s radiator. In response to the changing situation, I pushed Rosie to the front, giving her the orders to increase defense, increase attack power and ignore enemy defense. Three consecutive attacks ended the duel, completing this mission on relatively short order. 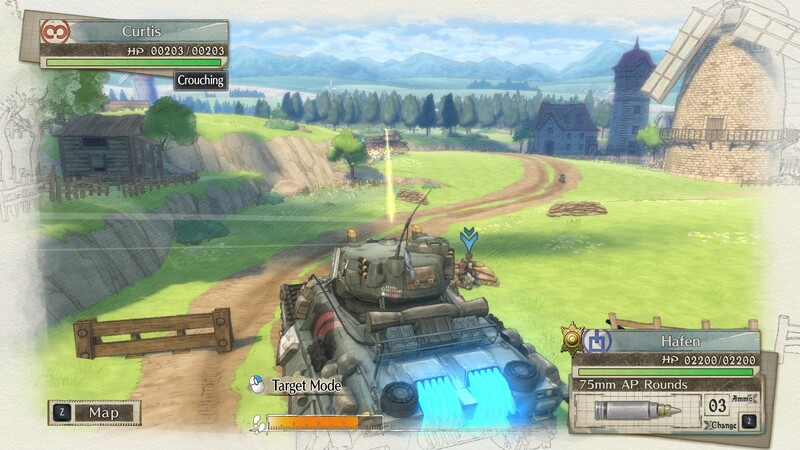 I’ve heard much about how Valkyria Chronicles can be unbalanced in some areas, and while this is true (the game does encourage expedience over elimination), that there will be a new game plus mode after everything is done means that one can replay missions to try different or unusual strategies without worrying about combat performance. The mission to divert the Marmota was one of the most straightforwards one in the game, bringing to mind the mission to rescue Princess Cordelia from Federation kidnappers. Set in a canyon, the goal is to trigger the right number of rockslides, pushing the massive land-dreadnought into a section of the canyon for attack by Gallian forces. Because characters splattered by the Marmota die instantly, this mission is best carried out with only Rosie, Largo and Zaka in the Shamrock: they will retreat when the Marmota runs over their position. 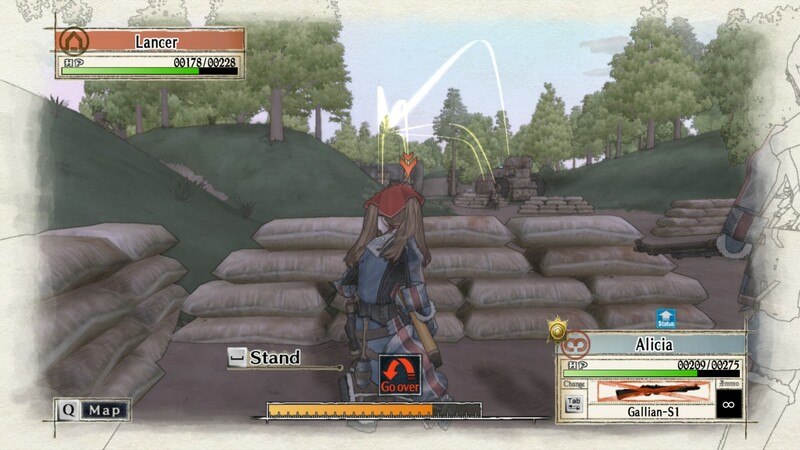 Making use of Alicia and the Edelweiss is all that is necessary to complete this mission: once Alica takes down the barricades, the Edelweiss can roll over the landmines and detonate them, allowing Alicia safe passage. While the Marmota is a vast weapon far larger than anything Squad Seven has experienced in previous missions, it is by no means intimidating: its large guns are fired after a turn is ended, and these are easily avoided. Once players reach the end of the objective, it’s a matter of ending the phase, allowing the Marmota to drive forwards. This is easily the most tedious part of the mission, but if all has gone well, the Marmota will reach the target point after eight turns, the number of turns required to secure the A-rank in this mission. The cutscenes show that the combined firepower of the Gallian forces is insufficient, but Squad Seven is tasked with returning to Randgriz and engaging it from there. It’s been some 14 months since I played the battle for the Great Vasal Bridge, but here, we’re back to take on General Jaeger and his Lupus a second time. In this showdown, the Lupus is equipped with heavy armour that absorbs damage the tank takes per turn. From what I’m hearing, the Lupus draws design features from the Soviet KV-2 and German Maus, both of which feature in Girls und Panzer. While seemingly intimidating, a shock trooper armed with penetration and demolitions boost allowed me to beat the Lupus in two turns: the first turn was to position the characters and get a kill of one of the level’s aces, then use smoke rounds to conceal Rosie’s position. Subsequently, it was a matter of wearing the Lupus down gradually before the turn ended. It’s been some years since I played something where infantry could disable armour: in games like Halo, I never particularly feared heavy armour because the shoulder-fired weapons (like the M41 SPNKR or the Spartan Laser) were sufficient to defeat armour. With the Marmota sustaining minor damage, the aim of the penultimate mission is to board this leviathan and disable the Valkof, a Valkyrur weapon capable of immense destruction. Maximilian uses it to annihilate a mountain top, consuming around a fifth of its charge in the process. The blast is enough to vapourise the mountain and probably has a yield of around 200kt, so a full-power shot would yield 1 MT. When I wrote the first impressions post for Valkyria Chronicles last year, the post came shortly after I set up a 2009 Mac Pro, attended a talk on software analytics and had a fried chicken poutine. This year, I helped one of the summer students set up a better Mac Pro with the ATI 5770; I left a small mess in the demonstration room, where the Mac we use for demos would not boot up properly, but managed to clean that up. Food trucks were on campus today, and I stopped by Wilk’s Booth. Because I was set to drop by the medical campus to attend a talk on business and medicine, I had their Ranchman’s Burger and a side of thick-cut fries this time around. I’ve no photographs to show this time around because the burger a little messy on top of being totally delicious, with bacon, maple-BBQ Chipotle sauce and plenty of onions. Today was also the hottest day of 2016 so far, and after the talk ended, I returned to main campus to attend my brother’s graduation, before celebrating with an evening out. I also picked up a small travel bag in preparation for the July conference. 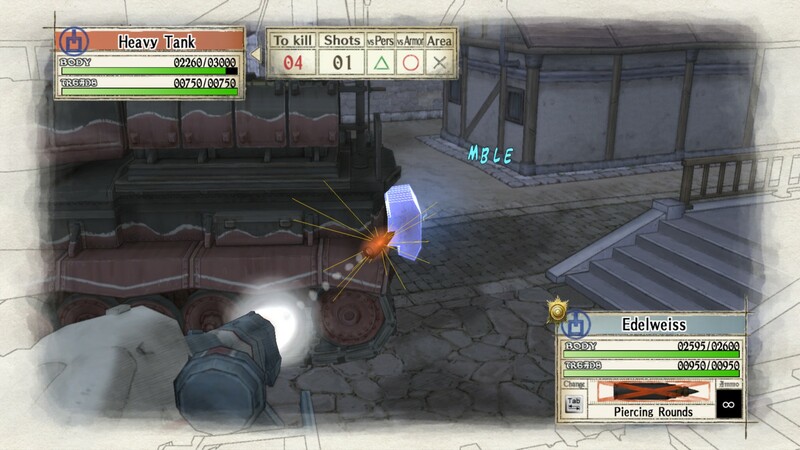 Back in Valkyria Chronicles, the penetration and demolitions boost orders are used to great effect in the second-to-last mission: once active, it will take 4 CP to destroy the Valkof. I’ve heard it is possible to complete this mission in one turn, although my Squad Seven roster and setup meant that it took me two turns to complete. So, after making my way through the campaign, I come to it at last: the ultimate showdown between Squad Seven and Maximilian. Although the anime made this fight more dramatic, the game incarnation is superior, having Squad Seven take on Maximilian’s Artificial Valkyrur system. Capable of reproducing the Valkyrur’s power, Maximilian’s system depends on external generators to keep him powered up, so it’s quite natural to attack the power sources. After blowing out three of the generators, Maximilian becomes vulnerable to fire. I’ve not used a sniper properly since mission seven, but in this final mission, I deploy Catherine to accurately take out a distant generator, before using Largo to dispatch the other two. Destroying more towers than this is a waste of CP, since the other towers will regenerate on Maximilian’s turn. Once the barrier protecting Maximilian is lowered, like the Rebel Fleet does in Return of the Jedi, it’s time to commence attack on Maximilian himself. I used attack boost, defense boost, penetration and awaken potential on Rosie, then pounded the living daylights out of him to end this mission in a single turn. It was back in May when I beat this: it was a Friday evening, and the skies were heavy with cloud cover. After firing the last of the shots that defeated Maximilian, rain began falling and the credits rolled. This is the end of my first journey with Valkyria Chronicles, and it’s a little surprising to see just how much time has elapsed since I picked this up. When the game entered my library, I was finishing my first term as a graduate student and was preparing to go for a winter tour of Taiwan. I fired my first shot in the game as I was ending my second term of graduate studies, and finally finished a year-and-a-half (well, 17 months) after buying it. It was a fantastic journey, and with this one finally in the books, it’s time to go and make some headway in Alien Isolation. 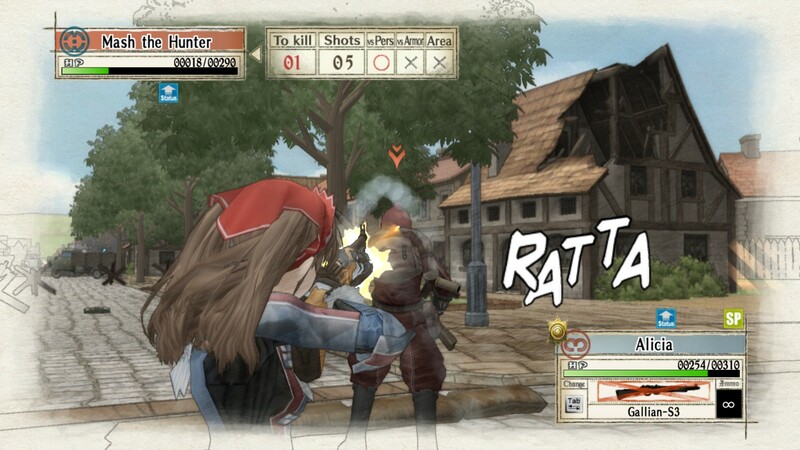 Taken together, Valkyria Chronicles is a game that stands as one of the best titles I’ve experienced, and overall, it is very easy to recommend this game to individuals, even those who are not familiar with Japanese turn-based tactical RPGs. 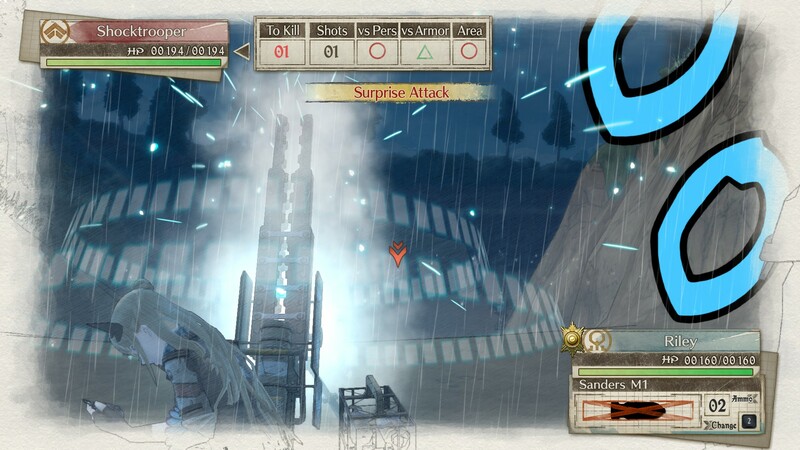 With generally solid gameplay, a fantastic art style that captures the nostalgic, old-time feel of an alternate universe, one of the best soundtracks composed for a game and a compelling story that allows players to truly feel like Squad Seven’s commander, Valkyria Chronicles is what a game should be: capable of immersing players in another world, in the process allowing them to empathise with the protagonists and feel clever for completing a particularly difficult mission. Furthermore, there are plenty of extras in the game: successful completion of the game unlocks the story missions for replay, and the Steam version provides free DLC that further augment the experience. 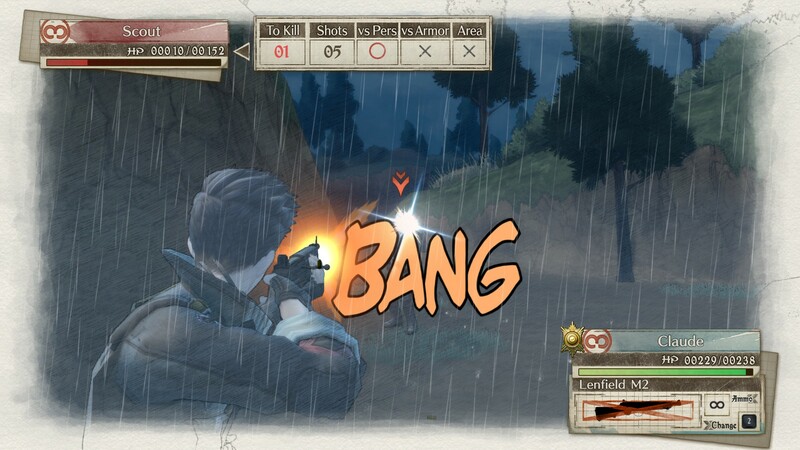 While the game is not mechanically flawless (the AI is deterministic and movement can be a little unsmooth), its presentation and content overall means that for its price, players get more than their money’s worth for Valkyria Chronicles. 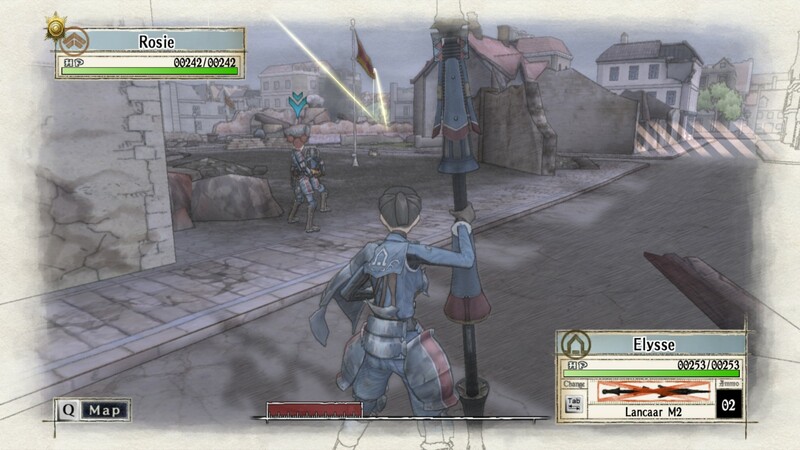 Thus, it is perhaps unsurprising that Valkyria Chronicles‘ Steam copy has sold over 800 000 copies as of this May. This is a game that thoroughly earns a strong recommendation, so for those who’ve not played it, one could go so far to say that they’re missing out. 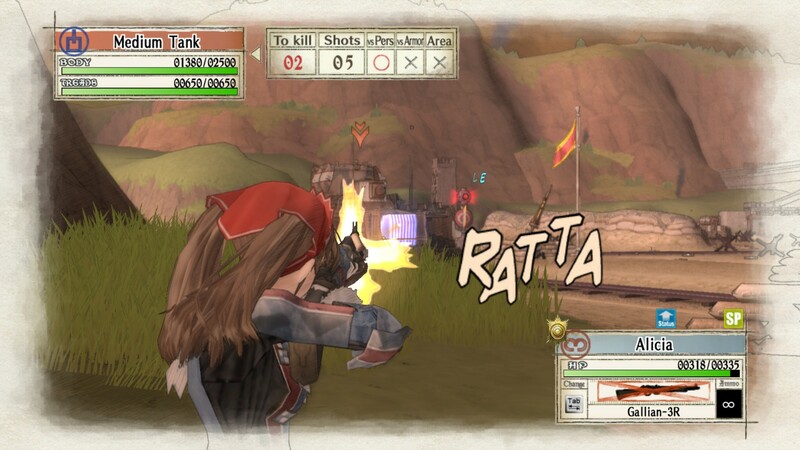 The game only goes for around 20 USD in the Steam Store and moreover, only requires a GTX 280 to play on full graphics; any modern computer will have no difficulty running this game, so unless one has but an integrated GPU, there’s no real excuse not to pick up Valkyria Chronicles and give it a spin. At this point in time, I’ve crossed over the three-quarters milestone of Valkyria Chronicles (or at least, what I presume to be the three-quarters milestone). 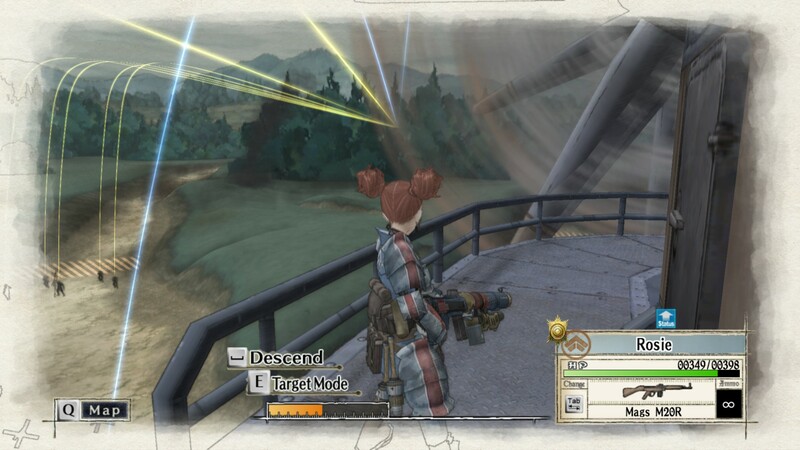 Fouzen and Bruhl have been liberated, and Valkyria Chronicles‘ own interpretation of D-Day at Marberry Shores campaign concluded quite smoothly. While the Gallian forces gain momentum against the Empire, decisive battles at Naggiar result in narrow victories for Gallia at the expense of incurring a large number of casualties. During the Battle of Naggiar, Alicia is revealed to be a Valkyrur of the same nature as Selvaria, and this leads to a growing rift in the militia. Welkin reassures Alicia that things will be alright and informs Squad 7 that Alicia’s newly-awakened Valkyrur powers change nothing; they will continue with their operations as they always have. So, I’m now set to embark on the Fight for Ghirlandaio to flush the remains of the Imperial forces out of Gallia. Since the campaigns at Fouzen, the game’s progressively thrown more interesting challenges at Squad Seven, and I am quite certain that the remaining four chapters in the game will require that all of my characters be at their absolute best for them to stand against the increasingly deadly enemies that make up Maxmilian’s remaining forces. 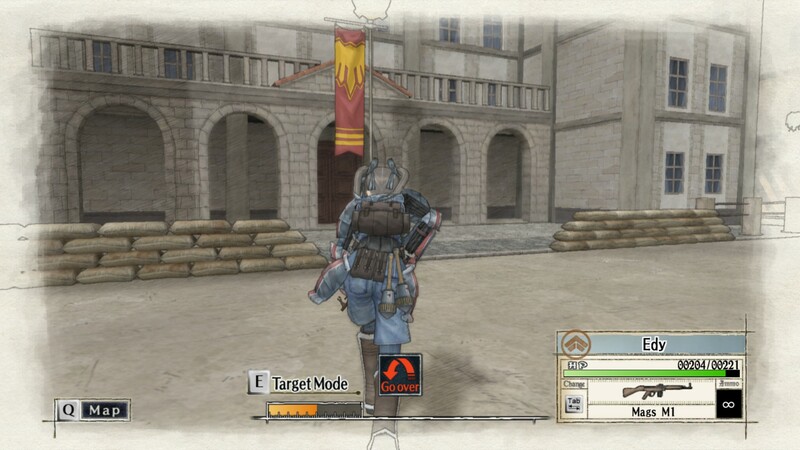 The thirty hours of time I’ve spent in Valkyria Chronicles means I’ve finally made use of the different mechanics to effectively direct each character to complete a mission. Weapons are continuously upgraded to ensure that everyone can deal effective damage against the Imperial forces, and through the skirmishes, I’ve gotten each class to elite status. With the classes at higher levels, I’ve unlocked a much wider range of orders and have been employing them liberally in each mission, boosting the statuses of strategically-placed characters to make them an incredible force. The orders are so effective that some missions can now be effortlessly completed, and seemingly-impossible missions suddenly become merely difficult. By this point in time, I’ve also unlocked a larger number of potentials for the different characters; these attributes can confer advantages or disadvantages. In light of ever-increasing mission difficulties, and the fact that I’ve learnt the “Awaken All” order, I’m now looking to reconfigure my line-up to ensure that each soldier is performing at their very best, all of the time. Particularly detrimental potentials, such as Susie’s pacifist potential, have led me to lose CP before; such characters will not be effective in conjunction with the “Awaken All” order. Taken together, the details behind each characters, as well as how their potentials interact with the different abilities and orders gives the sense that Squad Seven’s members are as organic and diverse as real people, further allowing players to empathise with them and play the game in such a way as to keep everyone alive. The Liberation of Fouzen in Valkyria Chronicles‘ anime was the first exposure I had to the nature of oppression and discrimination the Darcsens were subjected to, but Valkyria Chronicles makes it abundantly clear that this mistreatment is ill-placed: the Valkyrur were the true aggressors, destroying much of their homeland and pinning the events later known as the Darcsen Calamity on them. A major part of the game is how Rosie gradually comes to accept the Darcsens, and it was very rewarding to see this shift in perspectives. The concentration camps and use of Darcsens as forced labour are a direct allusion to the Third Reich’s actions during the Second World War. This brings to mind my final year of secondary school, where Eliezer “Elie” Wiesel’s Night was on the English curriculum, a novel based on Wiesel’s experiences at Auschwitz camp. In the novel, he speaks of his gradual loss of humanity and even faith, as the inhumane conditions in the camps degraded the human condition. Wile the Imperials mistreat the Darcsens out of malice, Rosie’s own anti-Darcsen sentiments arise from her background; in an Imperial raid that levelled her village, she lost her family and feels the Darcsens are responsible. As such, she’s quite cold to Isara for much of the game, but gradually comes around thanks to Isara’s persistent efforts in trying to reach her. Infiltrating Fouzen was dead easy compared to liberating it, but even this mission was not too bad compared to something like Barious: here, I make use of Alicia to move rapidly around the map to activate elevators that act as shortcuts of sorts, making it easier to move shocktroopers and lancers closer to the frontlines. I absolutely love the cloudy skies in this mission, as they remind me of the moody grey skies seen in Sora no Woto‘s fourth episode and the desert terrain of Break Blade. 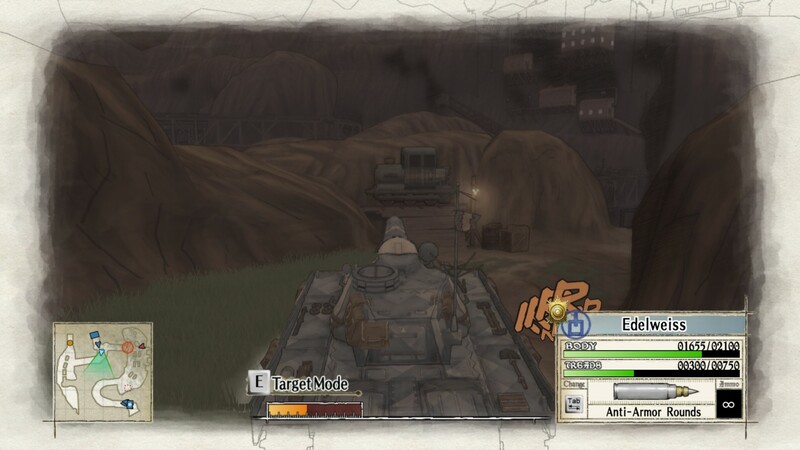 Enemy armour can be a threat to the Edelweiss and other foot-mobiles, but I usually ignore them unless they’re directly blocking the path en route to an objective. While I remark earlier that the Edelweiss can be a bit of a CP-hog, later missions necessitate the use of the Edelweiss in conjunction with orders and strategies in order to be completed on short order. Enemy aces usually are not on my list of priorities in the sense that I do not go out of my way to hunt them down and kill them, but I will take them out if an opportunity arises. I probably will go back on my New Game Plus to get the rest. They drop Imperial weapons that Squad Seven can use, and while Imperial weapons have terrible accuracy, their firepower is quite good. The objective at Fouzen is to destroy a bridge holding the Equus, a massive armoured train equipped with a 280mm main cannon. While this behemoth looks intimidating, its biggest weakness is its dependence on a rail system. This is exploited to bring the vehicle down, and General Gregor dies in the Equus’ wreckage. 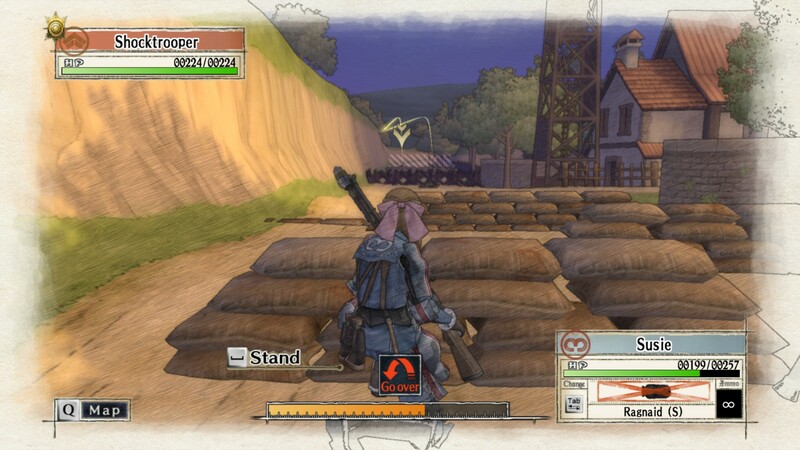 It’s a satisfying mission to send the Imperials packing, although Valkyria Chronicles also reminds players that there is a limit to what one can do: prior to fleeing, the Imperials have set the concentration camps ablaze, trapping the Darcsens. The Marberry Shores mission involves storming a heavily-fortified bridge: it’s a direct reference to the Battle of Normandy, the largest amphibious invasion in all of history. Unlike D-Day, Squad Seven is a much smaller force and must make extensive use of the smoke rounds to provide cover: some batteries are invulnerable to all damage and will quickly destroy an exposed foot-mobiles. Once all of Squad Seven clears the beaches, the mission transforms to a close-quarters engagement. It’s recommended not to add only the units that are necessary (Alicia, Rosie, Largo and at most one engineer) in the beginning, as that will require more CP to move everyone off the beaches. Here, I wield a flamethrower, a weapon available to the shocktrooper class after they hit level 11. It’s the perfect close-quarters weapon and can take out an enemy behind cover in one shot, provided that the wielder has not suffered a debuff. Towards the end of the Marberry Shores mission, I eventually ran Alicia up to the enemy base, took out the infantry there and managed to capture it. I can see why scouts, and Alicia in particular, are considered to be overpowered: while Valkyria Chronicles remained reasonably balanced up until the scouts became elites, at this point, scouts, in conjunction with the appropriate orders, become as powerful as Halo‘s Master Chief. In the aftermath of Marberry Shore, Isara is shot by an Imperial soldier and succumbs to her wounds. This marks the turning point for Rosie, who finally lets go of her prejudice against the Darcsens. She fulfills a promise to Isara and sings at her funeral. From here on out, Zaka becomes a permanant member of Squad Seven and rolls into battle in the Shamrock, a light tank has a greater range but lower armour and firepower compared to the Edelweiss. The page quote comes from this mission, following a conversation between Welkin and Alicia to rebuild Bruhl once all the combat is over. The mission to recapture Bruhl was dead easy and required only a single turn to complete. The level was designed so that Squad Seven would all move cautiously forwards, picking off snipers and eliminating opposition until the Imperial-held base is reached, but a single scout with the proper orders can solo this mission and reach the end very quickly. This optimised solution accounts for why Alicia now appears in so many of the screenshots. Besides picking up weapons from downed Imperial Aces, special weapons can also be unlocked for combat efficiency: by visiting Princess Cordelia at Randgriz, she will occasionally bestow medals and weapons for the player. While some of these weapons are inferior to the ones that can be researched via the tech tree, some weapons are superior and can be put to good use in the hands of an effective character. Selvaria appears at the first Naggiar campaign: wielding her Valkyrur powers to their fullest, she becomes a beast that blows away Gallian armour with ease in cutscenes, and even in-mission, she’s far more lethal than at Barious, being able to one-shot the Edelweiss or Shamrock. 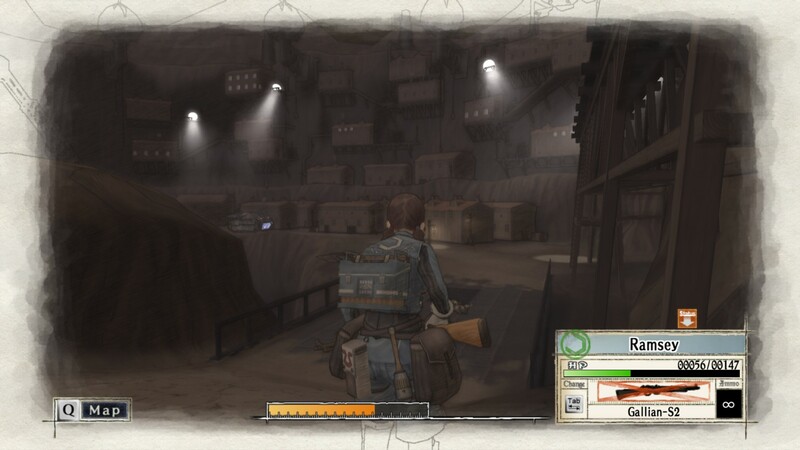 Fortunately, armed with some orders and an obscenely powerful scout in Alicia, this mission can be finished quite quickly. The traditional approach would be to capture the midway base and then deploy a lancer there, then gradually move him to the camp to destroy the heavy tank camped out there. However, good investment in levels should mean that one already has the “Demolitions Boost” order unlocked. This turns any scout into a lethal tank-killer: their high AP allows them to flank the tank and reach the exposed radiator. After this, a few rifle rounds are enough to destroy the tank. Valkyries are so overpowered that players (rightfully) do not have control over one: after being shot by Faldio, Alicia’s Valkyrur powers activate, and she cleans up a portion of the battlefield before collapsing. It turns out that Faldio’s been ardently researching Valkyria since Barious, after suspecting Alicia of being a Valkyrur when they gained access to the Barious temple. This mission’s initial objective seems simple enough, but after the main base is captured, a pair of Dromedarius-class tanks roll in. The Dromedarius-class are modified heavy tanks with an incendiary mortar that will kill infantry instantly, and their radiators have been modified such that they are bullet-proof. However, two well-placed lancer rockets will be enough to take these tanks out: Dromedarius A is the easier one to defeat, as Largo can be moved within a turn to a good position behind the tank. I realise that this post comes right in the middle of thesis season, and that I should be directing all my energy towards finishing. However, after spending six hours on just citations alone (and two hours performing some duties for the lab’s undergraduate students), I think I’ve earned the evening off. Tomorrow, I get right back to business and will aim to wrap up the citations before this week is out. 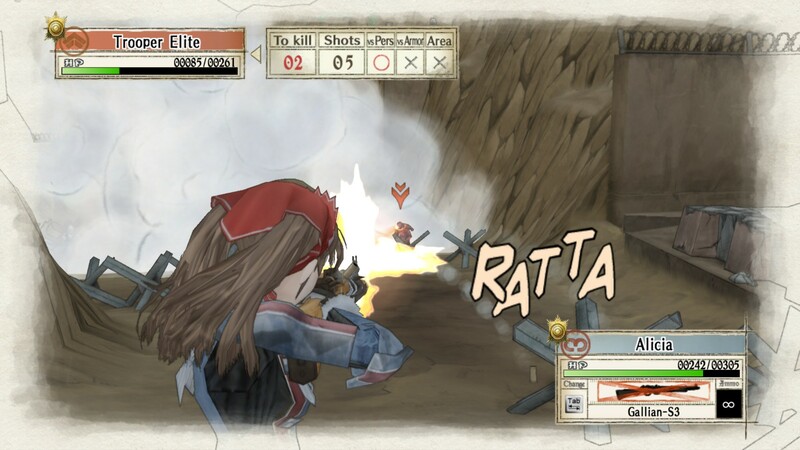 Valkyria Chronicles rewards combat efficiency over kill-count and unit preservation, but nonetheless, I make it a point to never let any of Squad Seven die in combat if I can help it. As such, I still have access to Squad Seven’s full roster, and I do wonder on some occasion what the War Cemetery would be like if any of my units do fall in battle (at present, it’s a location for learning new orders from the Aged Gentleman). I may have some thirty Steam hours in the game (roughly eighteen from the in-game statistics), but the visual representation of onomatopoeia is always fun to watch and further, is reminiscent of what was done in Haruhi‘s second season opening. 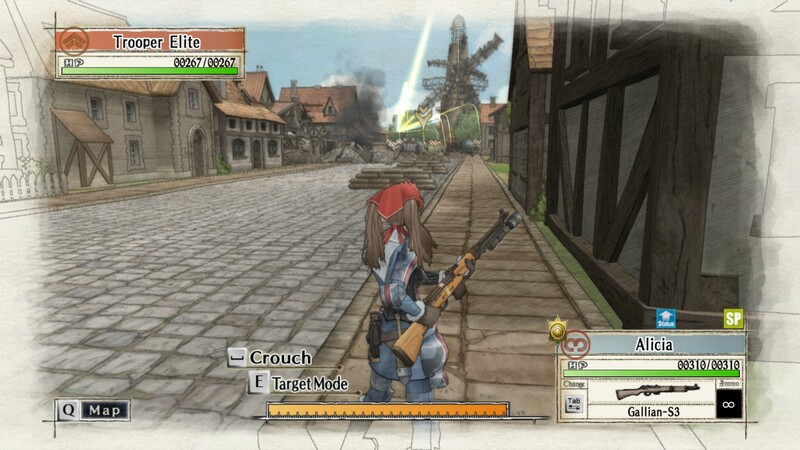 I’ve heard that Valkyria Chronicles has a Remastered Edition out for PS4, and from the looks of things, while the graphics have not been improved too much, the Remastered Edition has support for 60 FPS and 1080p resolutions. It’s not quite as dramatic as I had imagined — when I heard “Remastered”, I thought the differences would be comparing Halo CE to halo Anniversary or Call of Duty 4: Modern Warfare to the newly announced Call of Duty 4: Modern Warfare Remaster. I eventually just opted to give the Edelweiss “Demolitions boost” and pounded the Dromedarius B to oblivion from afar: the flames cannot harm armour. 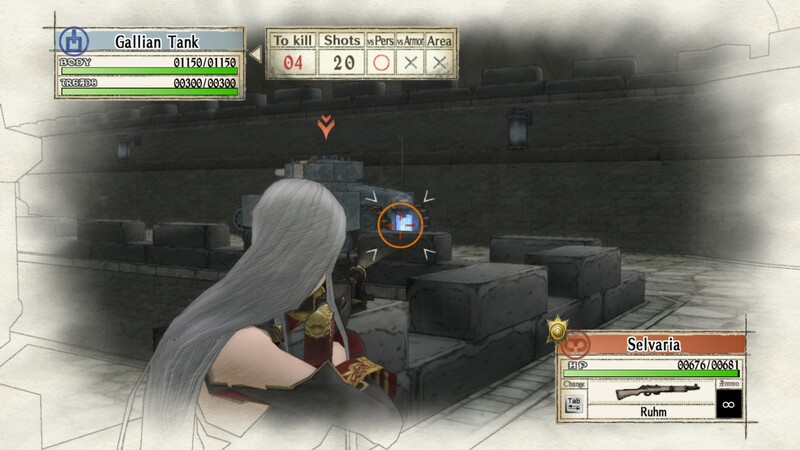 At the time of writing, I’m actually only a handful of missions away from finishing Valkyria Chronicles, and it’s been a blast the entire way. I do intend on unlocking all of the Steam achievements for the game at some point in the future, but for the time being, I think I’ll start Alien Isolation once I finish Valkyria Chronicles. 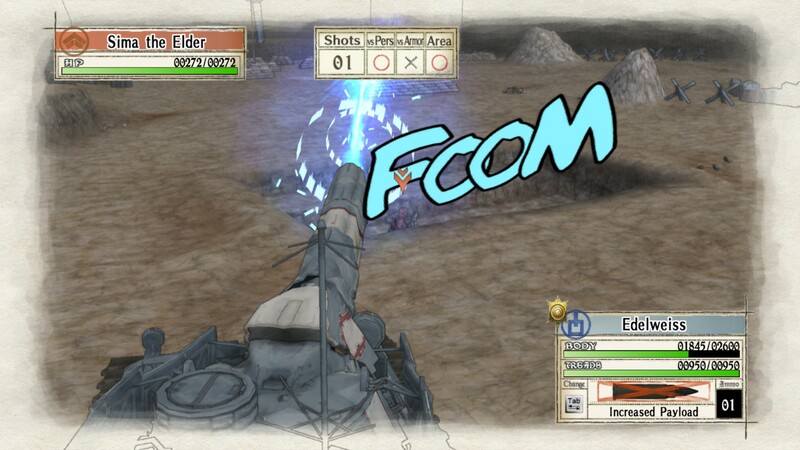 Valkyria Chronicles continues to impress with its solid gameplay and narrative: by this point, it is quite clear that the game stands head-and-shoulders above its anime incarnation. I’ve also begun playing through the different reports that have somehow slipped underneath my notice, and these represent yet another excellent side of the game, giving more insight into some of the backgrounds and characteristics for some of Squad Seven’s members (as well as unlocking more potentials for the lead characters, which are bloody useful). 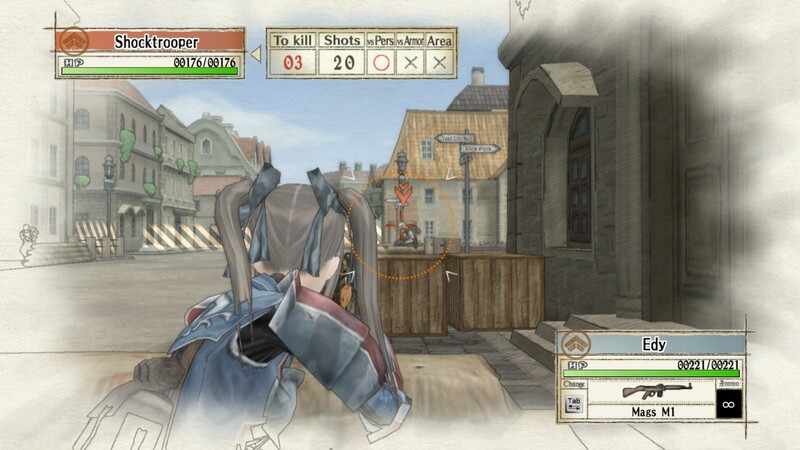 All of the different features in Valkyria Chronicles serve to prolong its playability; the combination of story, gameplay and extras means that from a value perspective, Valkyria Chronicles is easily worth the 22 CAD that it retails for in the Steam store (in fact, I would argue that the title could go for 55 dollars, the same as CLANNAD, and the game would still be worth picking up at full price); this is a game that now stands alongside Deus Ex: Human Revolutions as one of the absolute best games I’ve had the opportunity to experience. As such, I look greatly forwards to finding my own optimisations for the final stages of the campaign that will see Maxmilian defeated and peace restored to Gallia. The same evening the Calgary Flames fell to the Anaheim Ducks during the second round of the Stanley Cup playoffs, I found my previous strategies were inconsequential against the Batomys, a behemoth of a tank encountered during the seventh chapter. Subsequent attempts to best it also failed, and the timely release of Wolfenstein: The Old Blood resulted in my setting Valkyria Chronicles aside. I returned some nine months later, armed with a renewed resolve to burn the Batomys and continue on in the game. 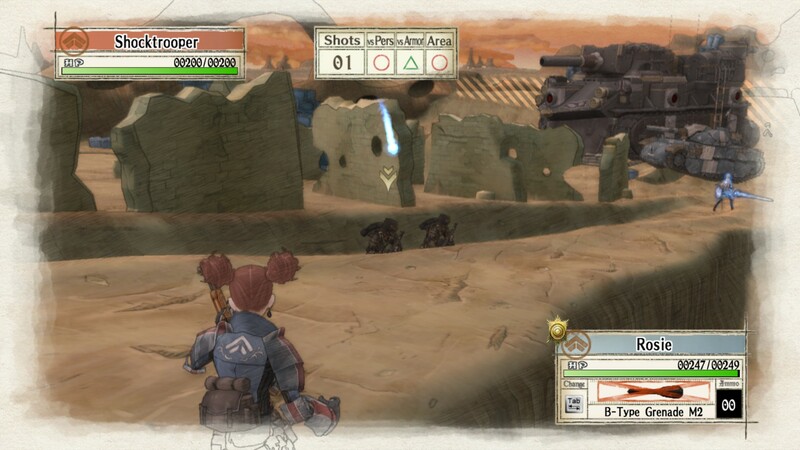 However, before we get to that point, the last post I did on Valkyria Chronicles was back in late April (and the screenshots are dated in March); since then, I’d recaptured the Great Vasel Bridge in Operation Cloudburst, captured the Imperial Base at the Battle of Kloden Forest and finished the first mission in the Barious Desert. 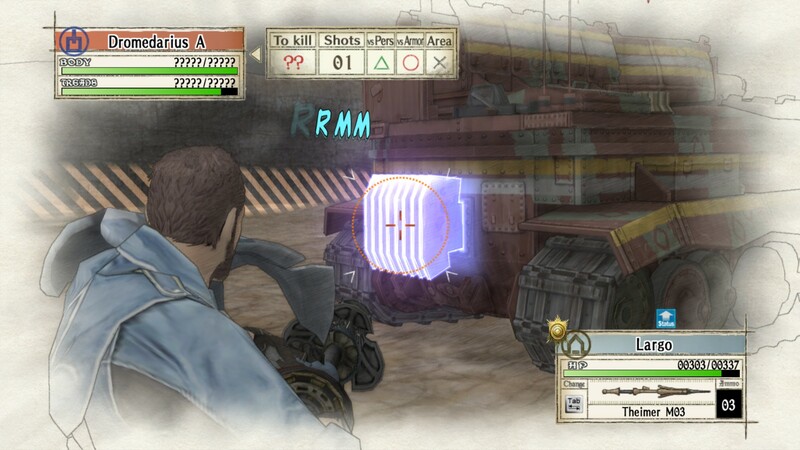 Up until this point, Valkyria Chronicles is reasonably straightforwards, but once Maxmillian rolls the Batomys into the seventh chapter, things suddenly take a turn for the challenging. My early strategy of wiping the guns out failed, and so, on my second attempt, I used the snipers and scouts to quickly dispatch enemy infantry in the north-east edge. Subsequently, I spent all my command points to blow away the Batomys’ secondary guns and managed to knock out two of its radiators. By this point, Selveria made her first appearance and promptly massacred any of my units out in the open, forcing me to use the Edelweiss as mobile cover. I eventually boxed Selveria into a corner (the Edelweiss is invulnerable to her attacks, unlike the anime), and a concerted bombardment soon took out the Batomys to end this mission. Subsequent missions follow Alicia and Welken after they get separated from Squad 7, and after they reunite, Welkin is sent off to a banquet at Randgriz to meet the Princess. She’s kidnapped by government agents, but Squad 7 rescues her. 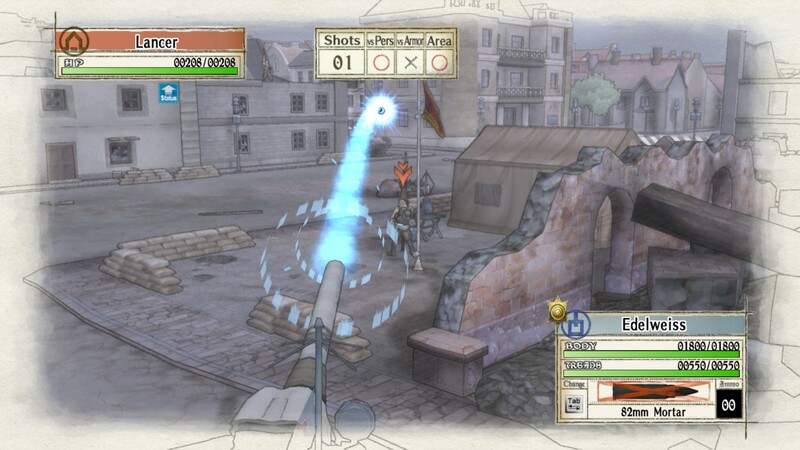 Compared to the average shooter, Valkyria Chronicles has been a most cathartic game so far (even with the intense battle in Barious): while most of the game is centered around each chapter’s battles, the cinematics add substantially towards the world building, and bit by bit, the nature of Gallia’s war with the Imperials is revealed. In contrast to the anime, the members of Squad 7 feel much friendlier and less skeptical of Welkin’s abilities as a commander. Similarly, Rosie’s dislike of Darcsens, though present, is less pronounced. On the Imperial side, while Maximillian’s anime counterpart seems as haughty as his game personality, his generals do not have as menacing a feel to them: I was particularly pleased with the moments that Welkin and Alicia share during their return to the Kloden Wildwoods. Here, they give an Imperial soldier a proper burial after attempting to save him, and later, General Gregor thanks Welkin and Alicia. It stands in stark contrast to what I’d expected from him given his dossier, adding more depth to the game. I still remember the day I played this mission for the first time in the campaign: it was a Thursday, and during that term, I had classes and a tutorial section to teach in the afternoon. Because progress was moving along reasonably well, I could afford a morning off. About halfway into the morning, I got a phone call asking about the Giant Walkthrough Brain, so I finished the mission and set about making updates to the UI so it’d work with a different screen setup. 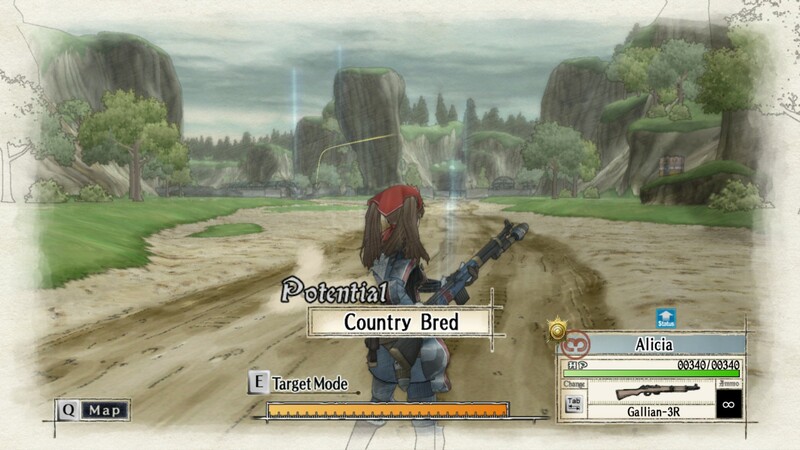 The Imperial forces in Valkyria Chronicles might be thought of as “agents” in a sense, since they have a set of situations they can exist in (proximity to my forces and their allied forces), a set of values for their internal data (health, inventory, coordinates), a set of actions (move, shoot, switch weapons, retreat) and some sort of decision function mapping their internal data and situation to a particular action. 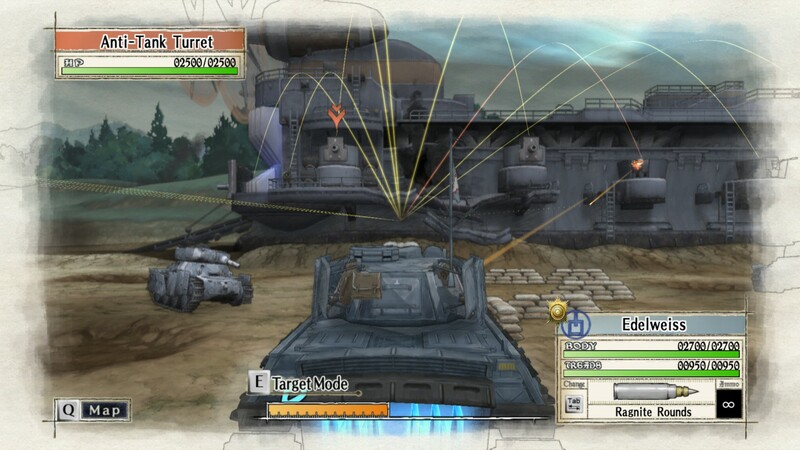 Tanks have a thermal exhaust port radiator that is vulnerable to anti-armour munitions: hitting a tank here will mission-kill it in a single shot, and while initially, lancers are needed to deal this level of damage, with the appropriate orders and equipment later on, other classes can do serious damage to armour provided they hit the radiator. 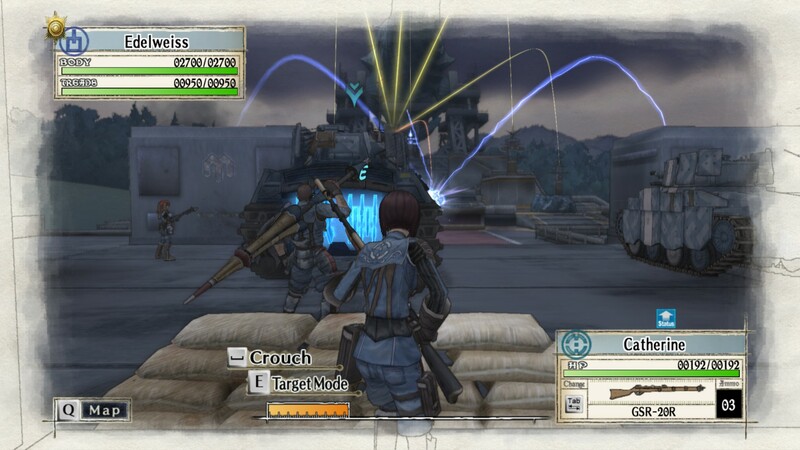 The classes in Valkyria Chronicles start out as being well-balanced for the most part; scouts have a massive range of movement but carry weak weapons, while shocktroopers have limited movement but utilise automatic weapons that can counter other shocktroopers. Lancers, engineers and snipers have more dedicated roles and are useful in fewer situations, while the Edelweiss costs two command points per turn and is not an overwhelming asset. Conversely, once the classes begin leveling up, the scouts become the superior choice for most operations: their underbarrel grenade launchers confer exceptional firepower, and orders can confer status boosts that further increase their effectiveness. Consider that I’m able to now beat this mission in skirmish mode using only one scout and one lancer on a single turn, using the characters reasonably expected of someone whose reached the game’s halfway point. While the Imperial forces satisfy the general definition for an agent, they do not appear to exhibit any complex cooperative behaviour and instead, appear to converge on a local optimum as far as countering the player goes. Knowing these limitations does make some missions easier, and there are cases where the enemy forces will be unable to make an effective move, ending their turn quite quickly. The Edelweiss is actually not particularly useful as an antipersonnel asset, and instead, I’ve found that its greatest utility is to act as a mobile shield: it is capable of repelling most small arms fire and even Selveria’s Valkyrur lance cannot do too much against it. This came as somewhat of a surprise to me, given that her power in cutscenes and the anime appear several orders of magnitude greater, but for this, I am grateful. 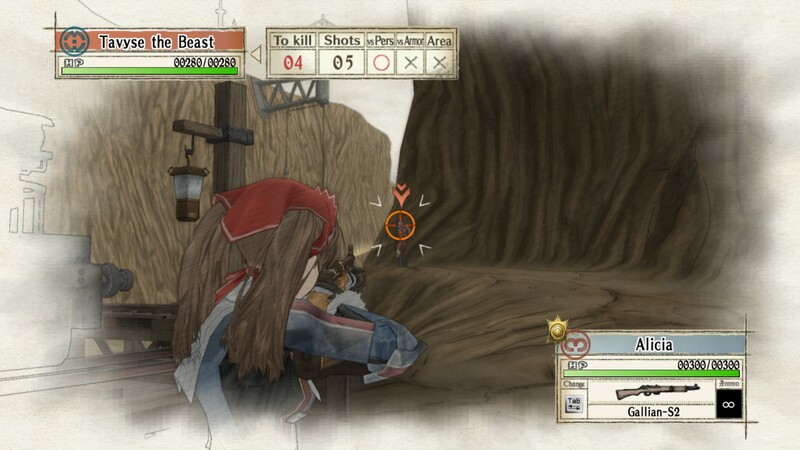 The snipers are a curious class: unlike the snipers of a traditional FPS, whether or not the sniper’s shots hit in Valkyria Chronicles is determined by probability based on level and weapon attributes. They’re a tricky class to utilise but for the most part, snipers excel at long range engagements; I typically field them to pick off enemy lancers or place them in a counter-sniping role. 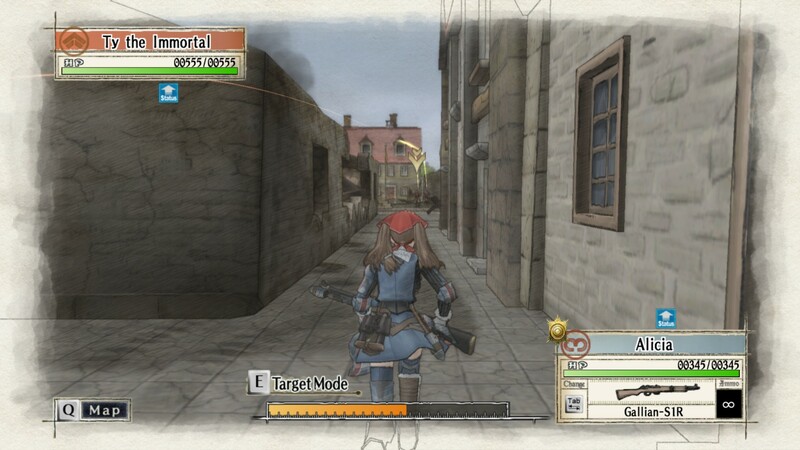 The artwork in Valkyria Chronicles is charming and well-suited for the game’s atmospherics, making use of gentle watercolours in conjunction with simple but clean 3D graphical assets to create the game world. While it would have been nice if some high-resolution textures were available, news has reached my ears that a remastered version will be released at some point in the future, so that could be quite interesting to check out. 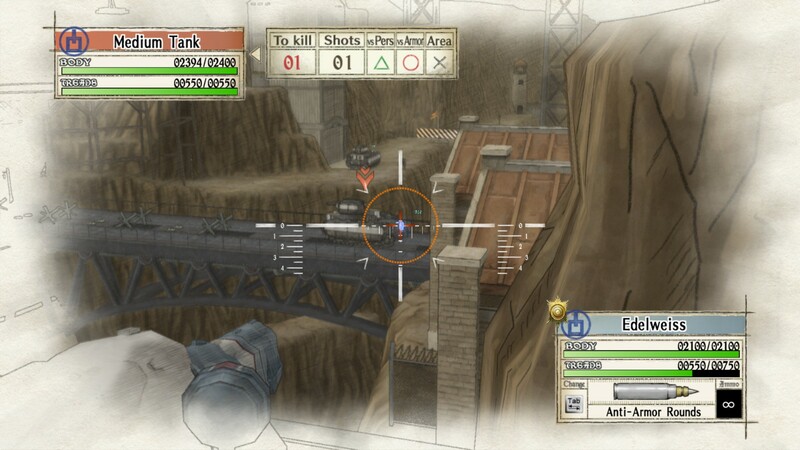 During the missions, enemy aces may be found, and dispatching them will unlock Imperial weapons for the player to use. These weapons are generally inferior to the Gallian weapons on the virtue of having inferior accuracy; even though they hit harder, I prefer weapons with more precision, and so far, have spent most of my research points on increasing weapon accuracy. From what the documentation reads, ranks (correspondingly, experience points) are conferred on the sole basis of number of turns taken, so hypothetically, one could adopt an extreme strategy that allows them to complete a level with the minimal number of turns at the expense of their forces. This brings to mind the application of a learning multi-agent system that was once entered in a contest to design an optimal naval fleet, and the algorithm’s result (a group of kamikazi boats) managed to defeat every other entry. 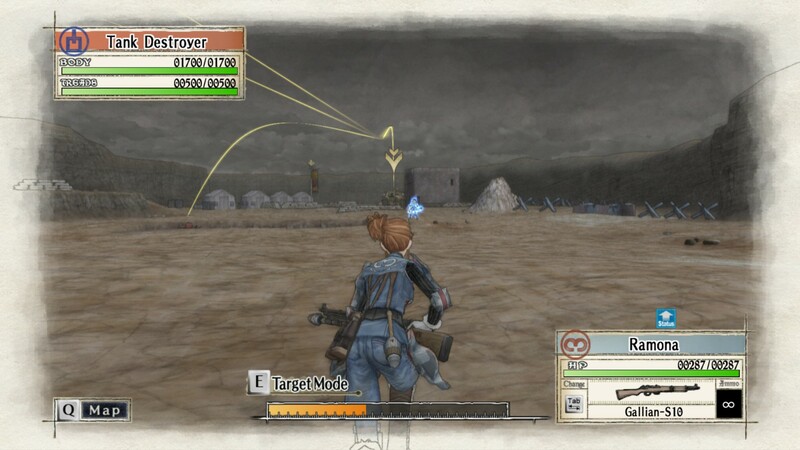 Thus, while Valkyria Chronicles rewards expedience over everything else, there is a bit of fun in figuring out how to effectively use one’s assets to eliminate all of the enemy elements on the map. During the first of the desert missions, I capitalised on shocktroopers to keep my tank safe, and utilised the scouts to quickly capture the enemy base. Each of the turrets on the Batomys requires three rounds to take out from an non-augmented lancer or the Edelweiss. I found the best trick in this mission was to eliminate all the foot-mobiles first, and subsequently pound each of the guns to oblivion. Shooting at the debris on the map is said to help slow the Batomys down, but the main reason one should do so is because the Batomys will fire its main cannon, exposing three radiator openings. Dumping a proton torpedo down the thermal exhaust shaft hand grenade down the exposed radiator plate will cripple the Batomys, and after all three radiators are destroyed, the tank becomes vulnerable to anti-armour munitions at last. However, things become more complicated after Selveria and some Imperial reinforcements arrive. Selveria can be seen in this image’s right-hand side: if I were to move any closer, my characters would be eliminated in a matter of seconds. I lost half my units in this manner, and while I was able to extract them from combat, it cost me several turns to do so. 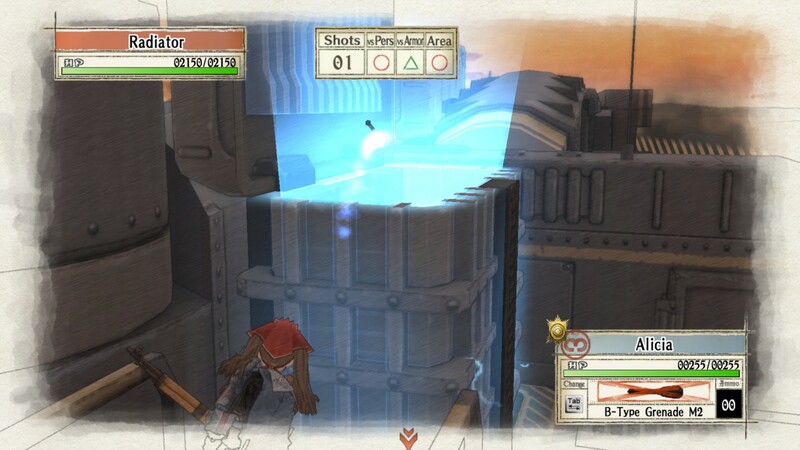 Eventually, I boxed Selveria in between the cliff wall and ruins using the Edelwiess, which answered her threat and allowed me to finish the mission. 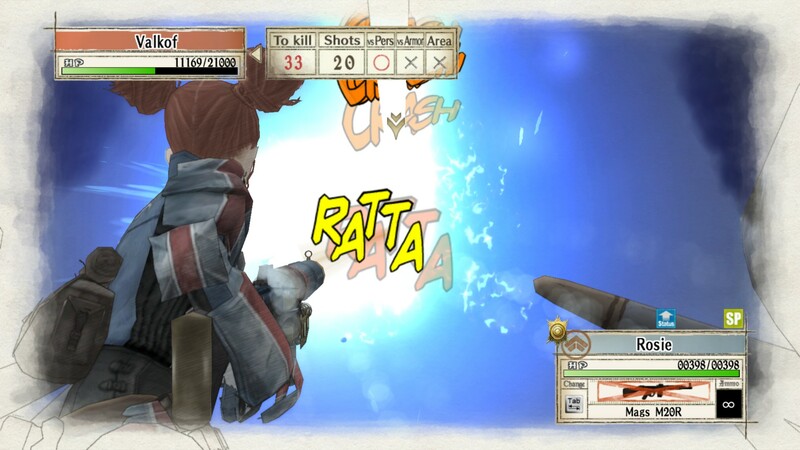 I made use of Largo to fire the killing blow that would finally end what was the toughest mission in Valkyria Chronicles up until this point. Fortunately, once the Batomys is immobilised and Selveria is blocked from moving (she’s invulnerable to any craft the player possesses), making use of the remaining command points and a full squad of lancers will finally stop this behemoth, and for me, lead to the completion of a mission I had slept on for eight months. The eighth chapter’s first mission is a relatively simple one: the goal is to get Alicia and Welken away from the mortars to a safe zone. Although Alicia starts out with an ankle injury, plants along their path will help Alicia regain her endurance. 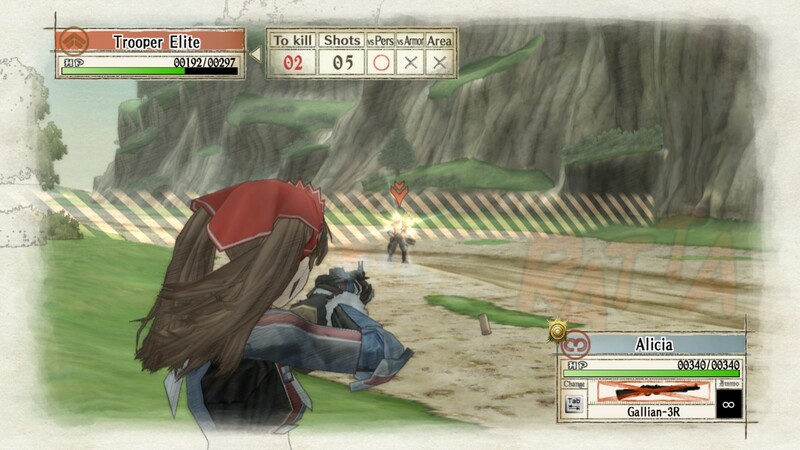 Although Alicia might be injured, her aim is still true: in conjunction with Welkin taking point, the pair will make it to the level’s end without too much difficulty. 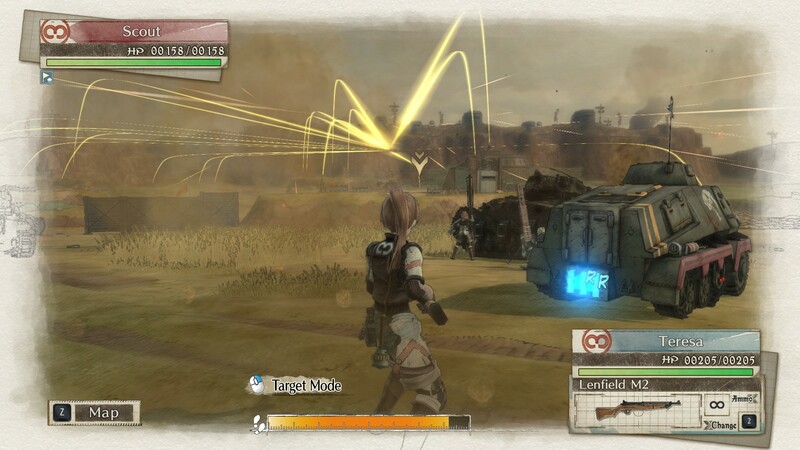 The trickiest part of the mission is on the third turn: a shocktrooper and scout will be present just around the corner, and their weapons will tear Welkin or Alicia apart. Instead, both should be positioned strategically so that the shocktrooper’s shots wind up hitting nearby trees, and a few carefully aimed rifle rounds will put both the shocktrooper and scout away. The remainder of the mission thus becomes relatively straightforwards. 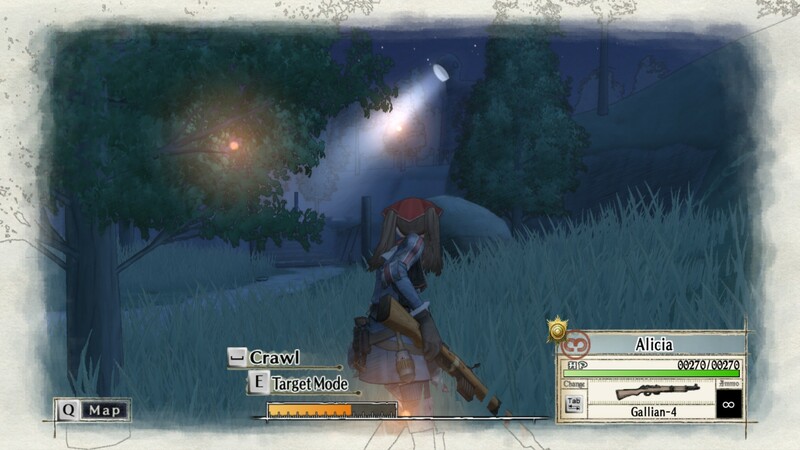 During the second mission of the eighth chapter, the first priority will be to get Alicia and Welkin back to the Edelweiss. Once this is done, the mission becomes trivially easy: the lancers can be picked off, and the Edelwiess must then be moved forwards after one uses their own lancers to destroy enemy armour. I lost of my units and had one scout left, but a bit of persistence allowed me to bring the scout up to the base after it had been broken down using the Edelweiss. Lacking the “Damage boost” and “Demolitions” boost orders, I was unable to complete the ninth mission in one go, but still managed to beat it in four turns to earn an A-rank. Reading Week affords me some breathing room, and given that today was quite productive, there might be a few openings here and there to finish the upcoming posts. Looking ahead, I’ve heard that Anthem of the Heart (Kokoro ga Sakebitagatterunda) will be releasing on BD/DVD on March 30, so a review will probably be written shortly after I check that out. Looking forwards, I’ve now the remaining half to complete. After reaching the tenth chapter, my scouts are elite status now, and my shocktroopers are approaching level eleven, as well. I imagine that the game will only get tougher from here on out, but faced with the prospect of wielding Alicia as a Valkyrur and unlocking the order that activates potentials, things do look to be quite exciting. 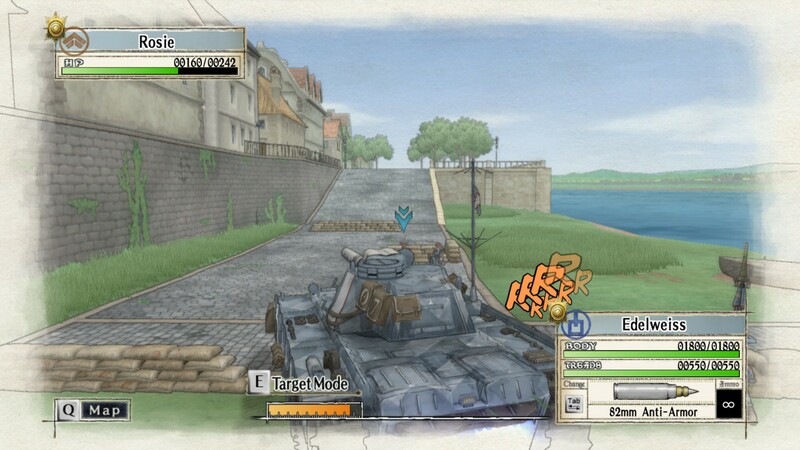 Given that the missions are the sort of thing that will necessitate sitting down with a fair bit of time, I’ll progress through Valkyria Chronicles at my own pace. With that being said, while I probably won’t finish this game in the next half-year, I do promise to finish before, say, when Half-Life 3 or Girls und Panzer Der Film is released (in fact, I wager that the former will come out before the latter, given the latter’s secrecy on the matter). 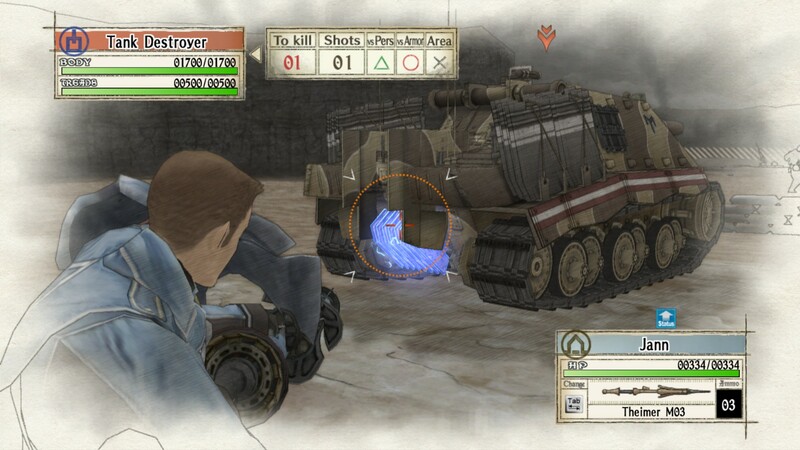 On an unrelated remark, there was another post at this blog titled “Valkyria Chronicles: At the halfway point“, and it even had the same slug. I only just realised that and have since modified the title so it reads slightly differently. 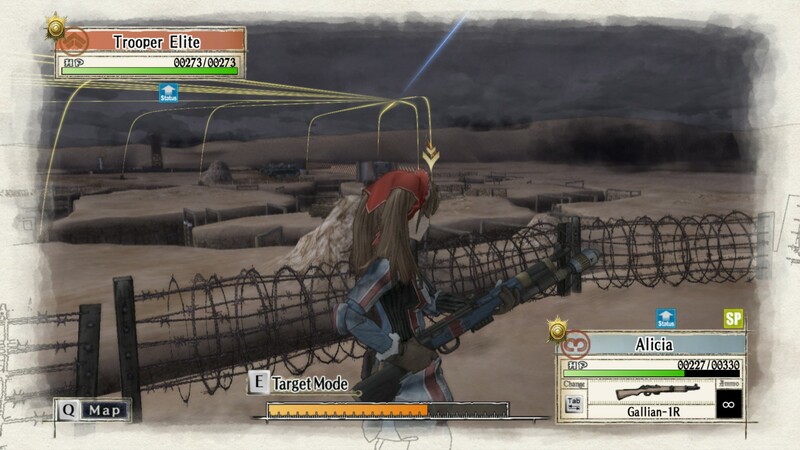 Looking back, I never really expected to have the opportunity to play Valkyria Chronicles for myself, but here we are at present.